Guardians of the Galaxy 3 was cover dated August 1990 and was on sale June 1990, sharing the spinner racks with Black Hawks #16, Brute Force #1, Checkmate #30, Excalibur #25, Firestorm #100 and Spider-Man #1. Split decision was written by and pencilled by Jim Valentino with assistance from Steve Montano, Ken Lopez and Evelyn Stein. 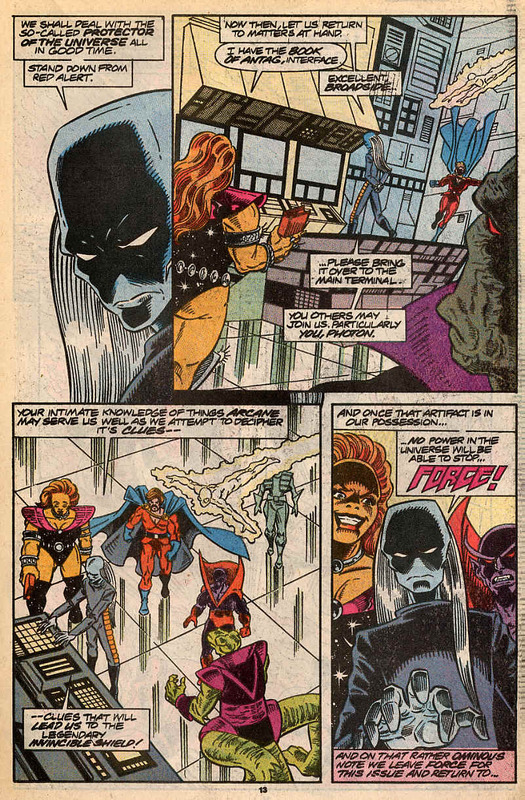 It opens with Nikki being held at gunpoint by Taserface (I am still struggling with that name) and Aleta/Starhawk hit by the Stark weapons. 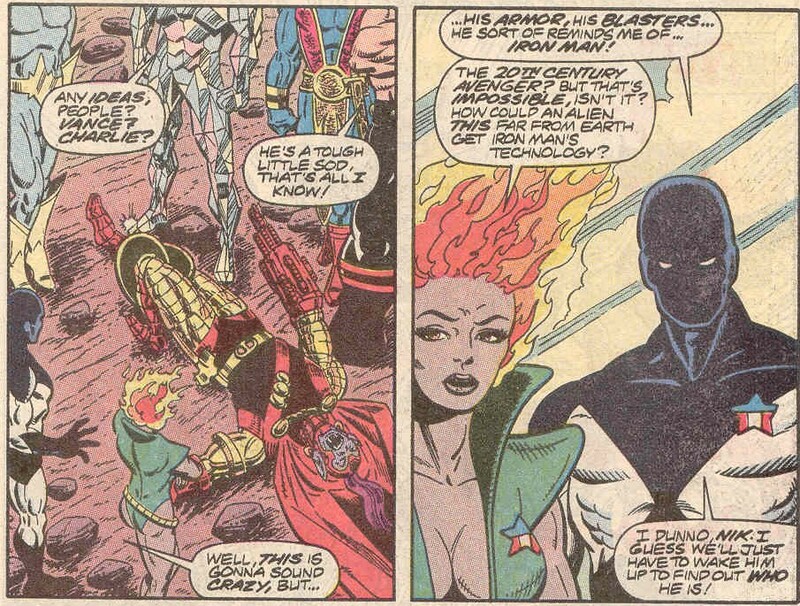 While Vance checks on the fallen Starhawk and Aleta, Martinex freezes Taserface to keep him still while they plan. Vance sees that is no longer merged with Starhawk and when Vance clears the way of some Stark troops, Starhawk simply stands and flies away. He states that he must go, once again quoting that he is one who knows. 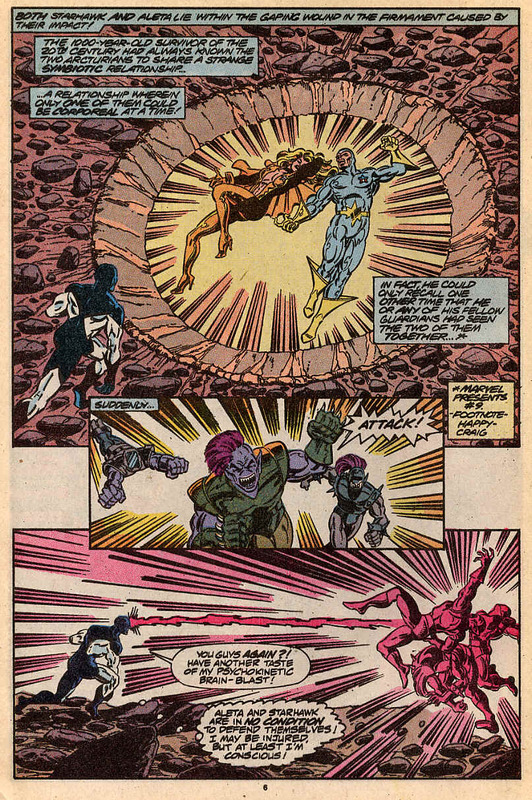 Vance uses the star-badge on Aleta’s chest to teleport her to the Freedoms Lady and heads back to Charlie and Martinex. Meanwhile, Yondu awakens in a Courgan home, with a sharp knife pressed against his throat as a native of Courg struggles with the desire to kill him. 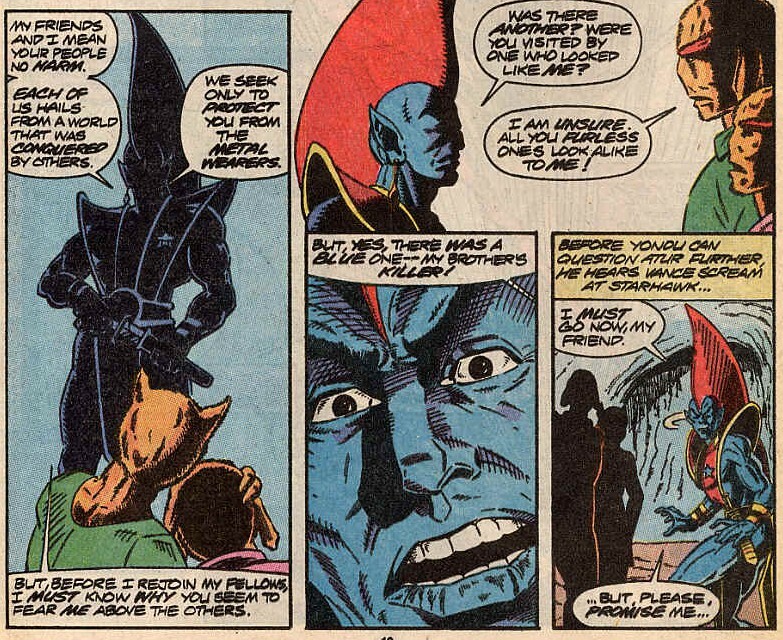 Yondu compliments the man on his compassion and asks why he feared Yondu so much more than the rest. The Courgan, known as Atur tells Yondu that there were other visitors before and that one like him killed his brother. Yondu tells him that he is one of a group who’ve all had their homes conquered and enslaved and seek only to protect Courg from the Stark. He then tells him he will return and talk with him again. 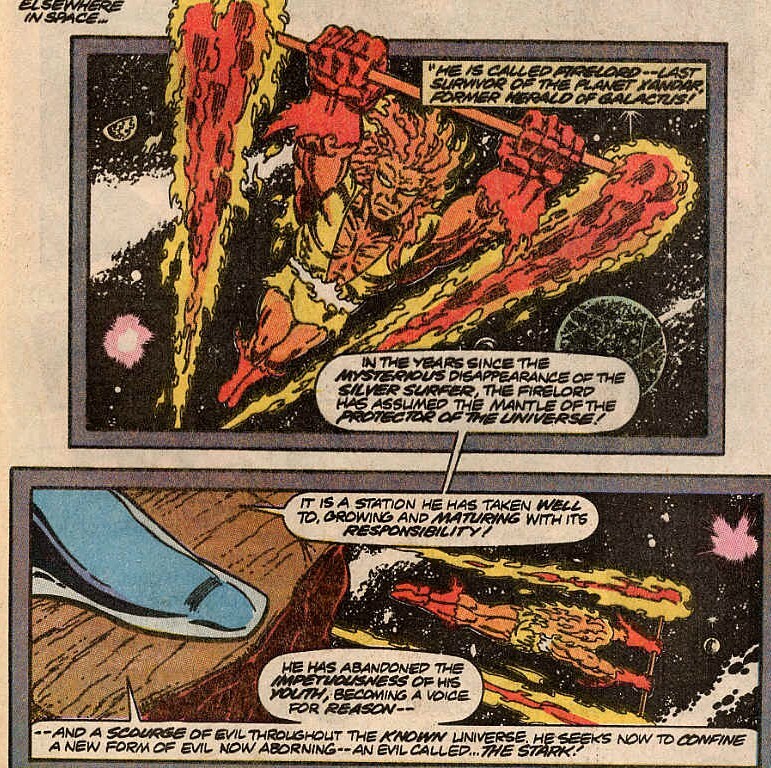 Then we have another cut-away with Firelord flying by. This time the people who see him are a group of aliens calling themselves Force. They have a copy of the book of Antag as well, so it seems reasonable to assume that they are the group who keep beating the Guardians to the clues relating to their quest. I’d go into them more, but they’ll have their moment to shine soon enough. Back to Courg, Nikki’s body heat has started melting the ice and before Taserface can get free Vance blasts him. 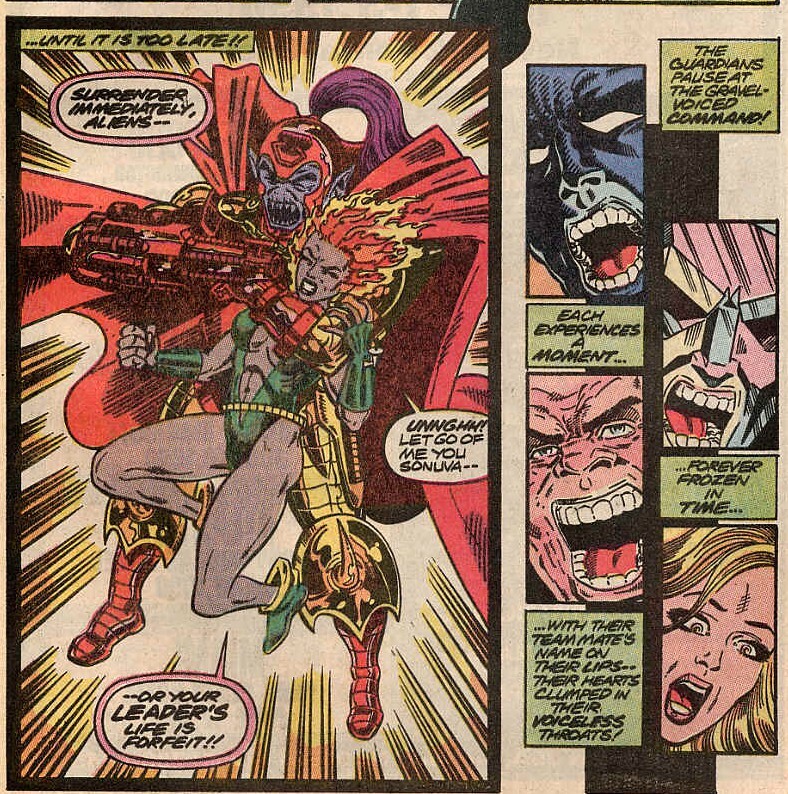 Nikki in revenge, blasts Taserface’s unconscious form on maximum stun, which will leave him in agony when he awakes. Martinex tries to berate Nikki for her actions, while Vance calls on Charlie-27 to return to the ship, but he has another goal in mind. The team are back on the Freedom’s Lady, Charlie returns carrying the Officer overseeing the Stark troops on Courg. On the Stark homeworld, the High Sister of the Stark is told of the Guardians’ interference. The fleet is put on yellow alert, but the scene does absolutely nothing else. Aleta has now awakened and feels the absence of Starhawk and is very happy about that. Vance has an adamantium cover to his arm and it’s suggested that he covers his entire costume with it. The team is then called to see that a Stark ship has arrived and is now demanding their surrender. 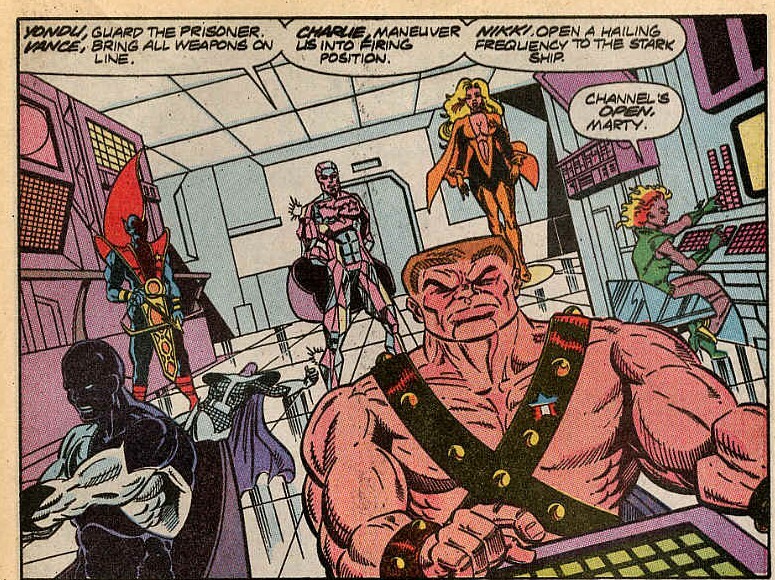 The Guardians try to negotiate, using their hostage as leverage. This doesn’t go well. 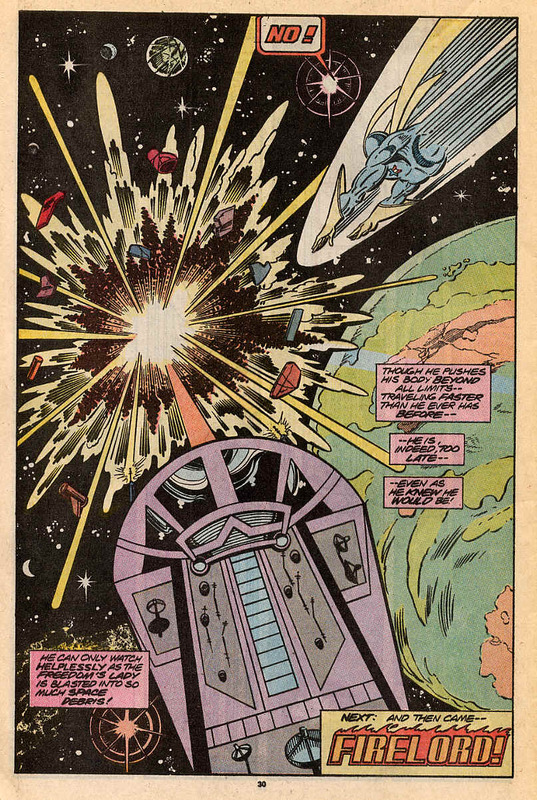 The scene switches to Starhawk sending out some sort of flare in deep space and flying back to the Freedom’s Lady as fast as he is able, just in time to see the ship destroyed by the Stark. 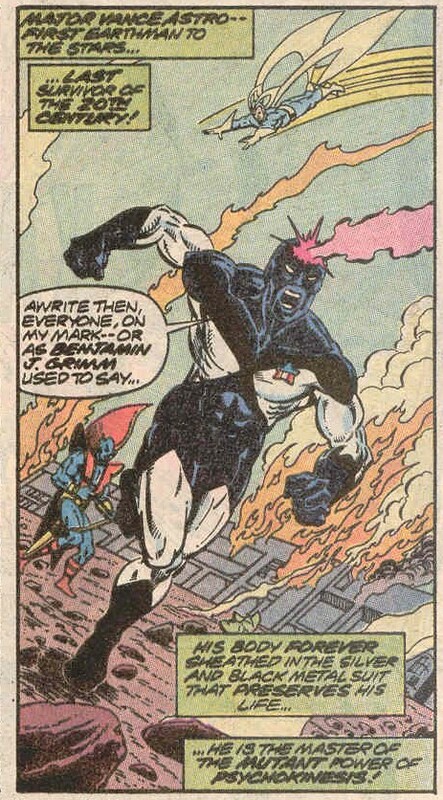 Tensions between Starhawk and Vance Astro resurface after Starhawk needs to leave without checking on Aleta. 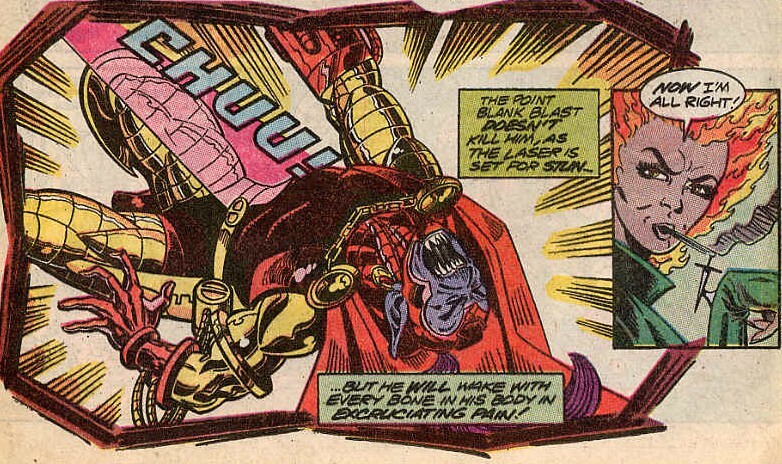 Nikki, still has a number of anger issues and willingly tortures the unconscious Taserface with her wrist lasers. Yes another appearance of Firelord, in which he does nothing other than get noticed by someone else. 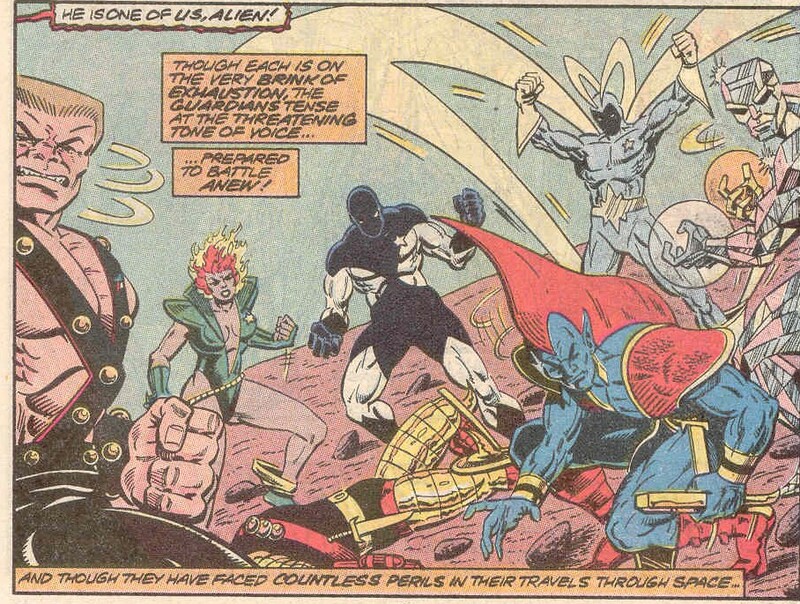 The other group of aliens searching for the shield that the Guardians are searching for are called Force and one of them, who’s face is obscurred, may be the one who killed Atur’s brother and another looks very much like Brahl, who was one of Korvac’s minions. Charlie-27 in battle does pretty much whatever he wants to it seems. When everyone is heading back to the ship, Charlie just carries on with what he’s doing. He’s also picked up the nickname of Chunky from Nikki. It would seem unkind, but considering he is 11 times more dense than a regular human, it sort of fits. Starhawk comments that he knows that his flare will be seen, but he also knows that he will not get back to the ship on time. This is one of the clues regarding his status as One-Who-Knows, which will be answered in the very near future. Guardians of the Galaxy 2 was cover dated July 1990 and was on sale May 1990, sharing the spinner racks with Adventures of Superman #438, Deathlok #1, Demon #1, New Warriors #1, Shade: The Changing Man #1 and Transformers #68. This comic has the distinction of being the first Guardians of the Galaxy comic I ever bought and as a result has a special place in my heart. 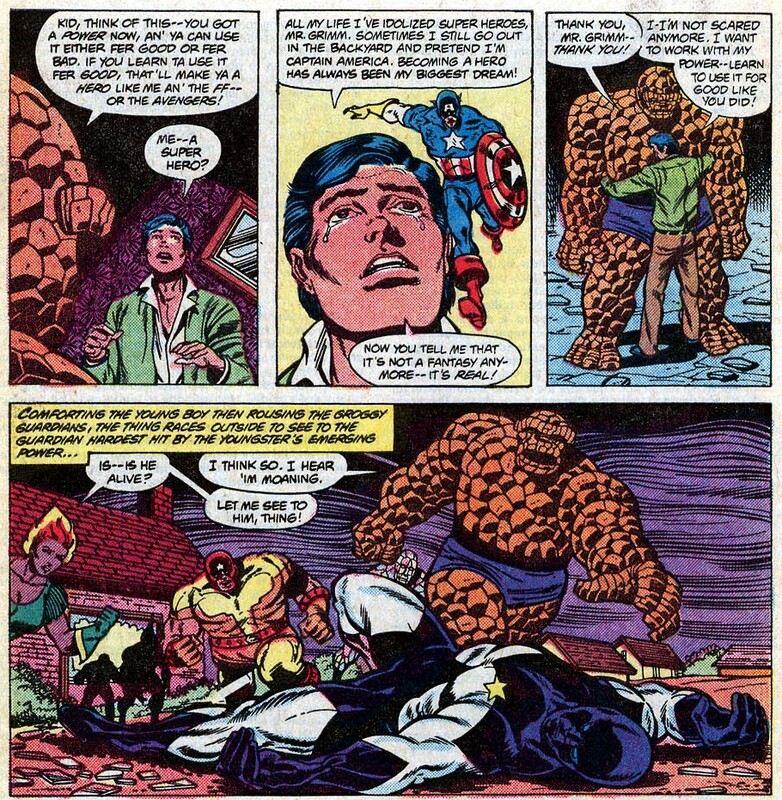 The Stark Truth was written and drawn by Jim Valentino and picked up right where #1 stopped. The Stark have arrived to re-assert their claim to Courg and to avenge the defeat of Taserface. The Guardians fight back at the new arrivals, but are unable to prevent the Stark from retrieving Taserface as Vance’s costume is slashed across the chest, exposing his body to the air for the first time in centuries causing excruciating pain. Martinex runs over to freeze the wound, whilst a Stark warrior punches Yondu into the home of one of the natives, now two of the Guardians are out of the fight. 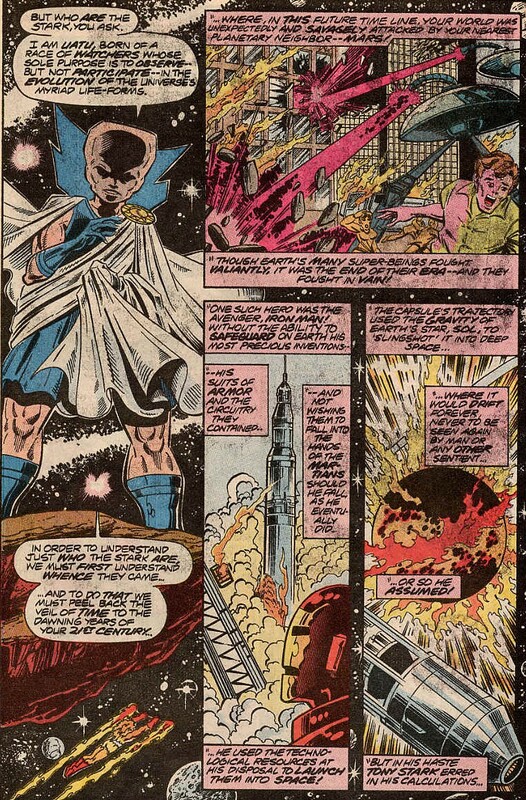 Then the scene shifts to what appears to be a random appearance of Firelord, one time herald of Galactus and now acting as protector of the universe. 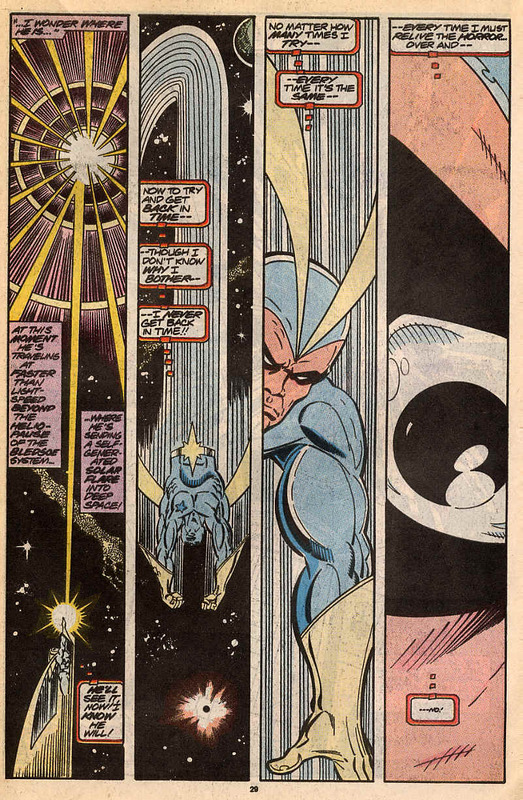 He is spotted and so begins a narrative by Uatu, the Watcher. The Watcher as most Marvel fans know, is one of a race of powerful creatures who’s only purpose is to watch, never to interfere. His role in this is to give the origin of the race known as the Stark. 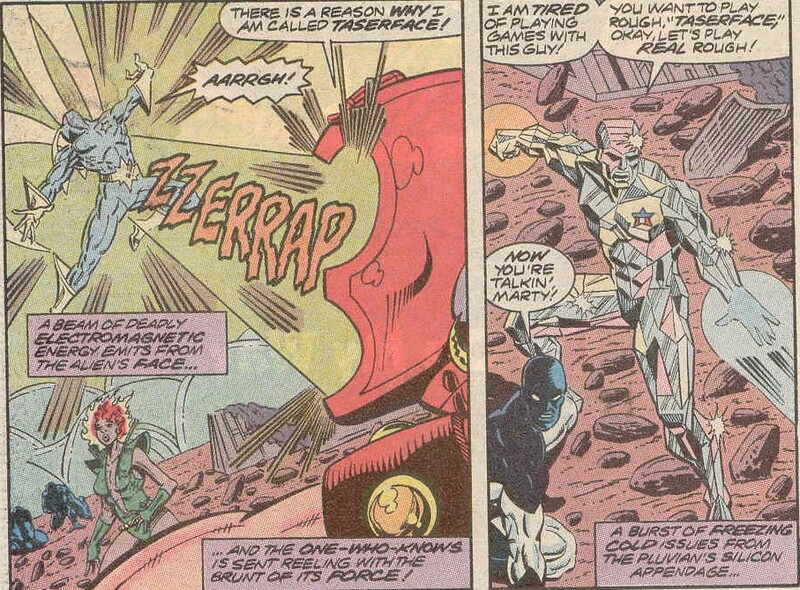 Iron Man during the war of the worlds, sent his armour into deep space to prevent it falling into the wrong hands. It ended up on an alien world, the primitive inhabitants using the armour and it’s technology to accelerate their development and launch them into a culture of conquest and resource explotation. They are imperialist warmongers, each with the power of Iron Man. Back to the battle and Charlie-27, whilst admiring Nikki, notices that the Stark favour battling him, than her and reasons that with the Stark field commanders being female, that having another female on deck would be a tactical advantage and commands Starhawk to change places with Aleta. 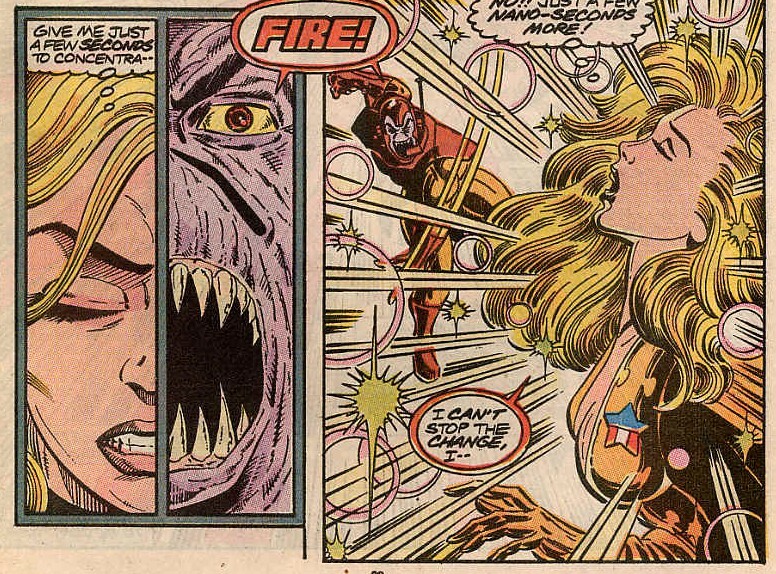 Aleta finds herself surrounded by Stark soldiers and strikes out with her solid light powers, killing one of the Stark. 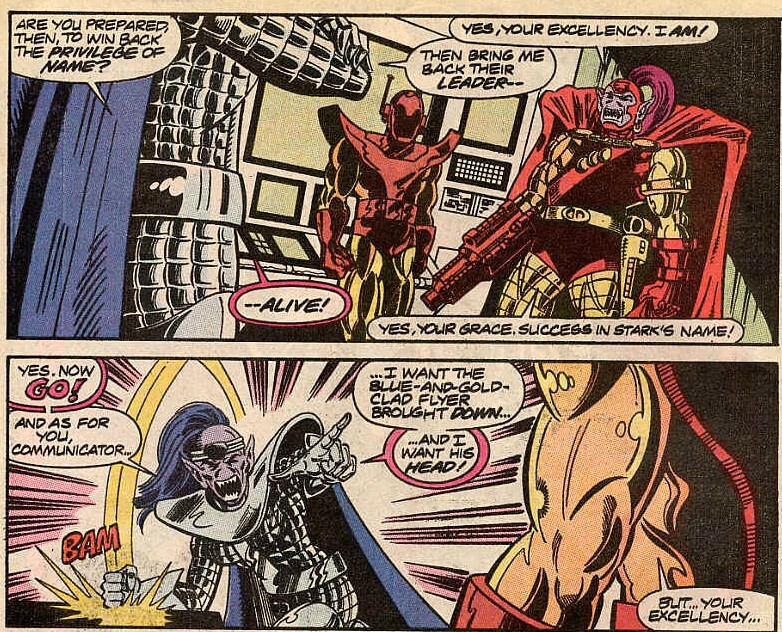 The Stark’s leader is told of this soldier’s death, reacting as though her death in battle bought shame to her family and Taserface’s defeat has cost him his name and he is dispatched to bring the Guardians of the Galaxy’s leader. 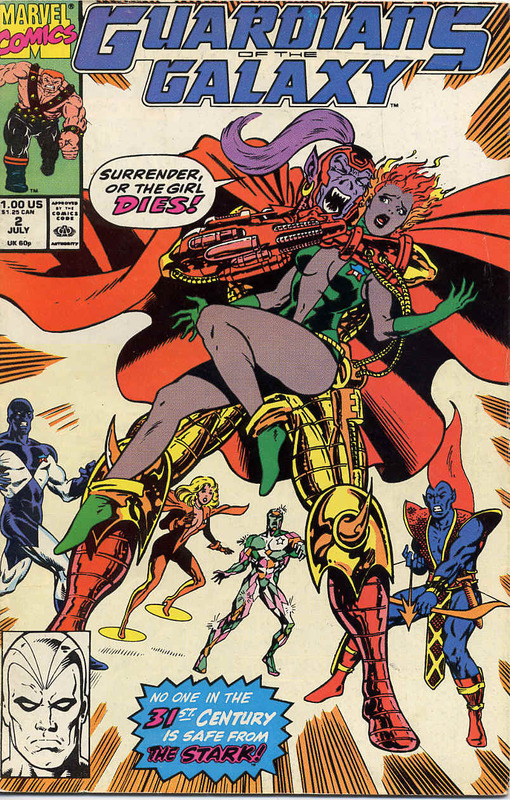 The issue ends with Taserface grabbing Nikki from behind and demanding that the Guardians surrender. 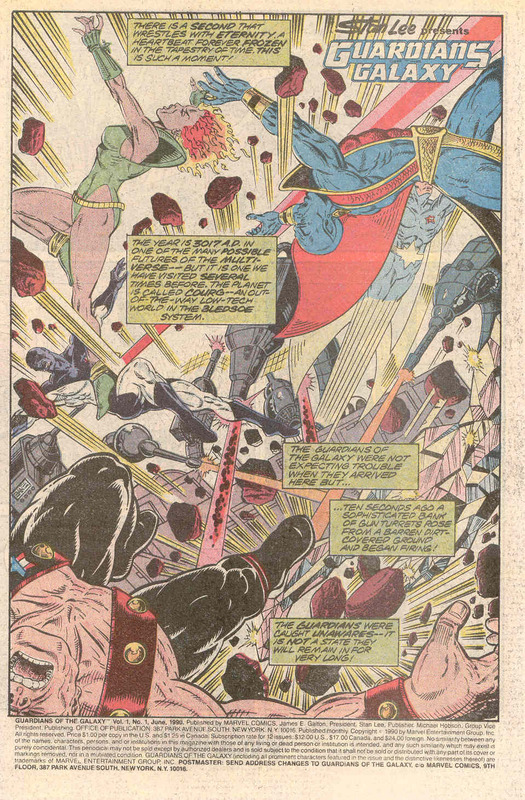 As this is going on, Aleta is under fire as she tries to make the change to Starhawk and is hit by several energy blasts mid exchange and for a second, it looks like there are two of them in the blast zone. Points of Interest: The Stark are on the immediate attack and do not try to talk or investigate. 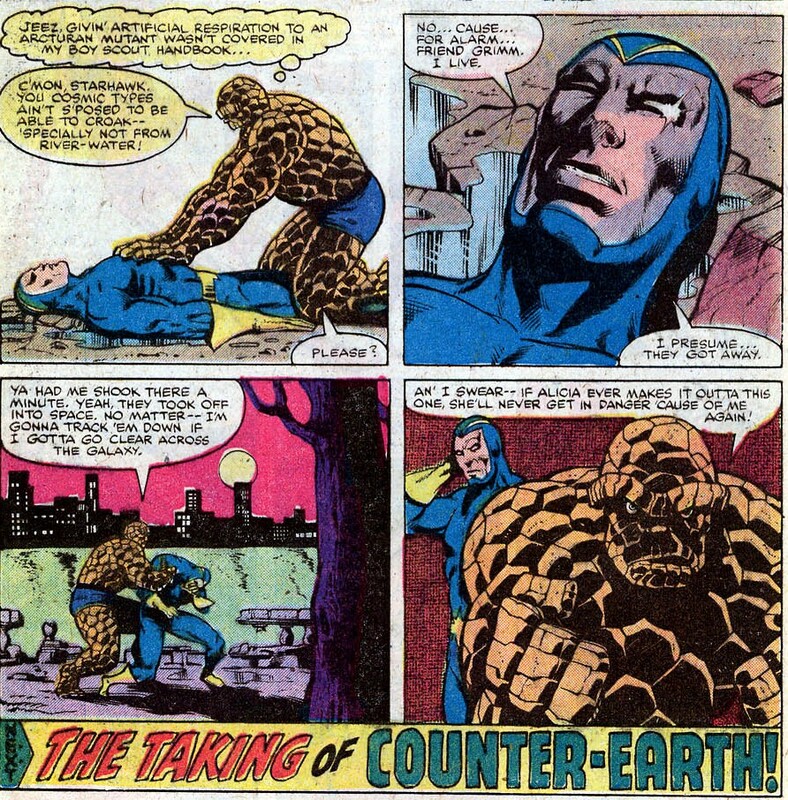 Vance’s suit is ripped open, it says that it’s the first time in centuries, but in Marvel Two in One #69, he takes his mask off, so that makes little sense. But the pain and shock are well shown and a nice reminder that Vance is a prisoner of his own skin and even showing his face to his father was a massive risk. Although Martinex is the team leader, it’s clear that he defers to Charlie-27 as a battlefield commander as most of the tactial decisions are made by him. The Stark are a matriarchial society, where women are revered and status is all. Vance and Aleta have become quite flirty with one another, which is a new development. The Stark cannot conceive of male leadership and so assume that Nikki is the leader, despite her being the youngest. Both Firelord and the Watcher are still alive after over a thousand years. Notes: It was a quality issue, continuing the story on Courg and layering in bits of exposition and early 90s action. The characters are written consistently and are becoming more and more likeable. I remember buying this and the next month I bought the next one and and the rest is history. When I first came up with the idea of doing a GOTG blog, this was what I wanted to look at. When I started collecting comics at the start of the 90s, visiting comic shops and going to comic marts, this was one of the first titles that really hooked me. 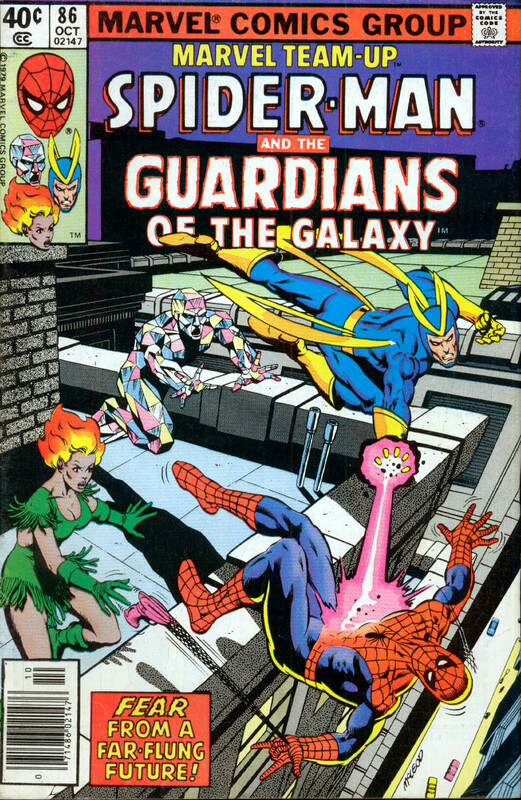 A lost little gem amongst the comics of the time, it put the Guardians of the Galaxy in their own eponymous comic and gave them the chance to shine. A large part of that shine was the writer and artist of the first two years of the Guardians of the Galaxy, Jim Valentino. 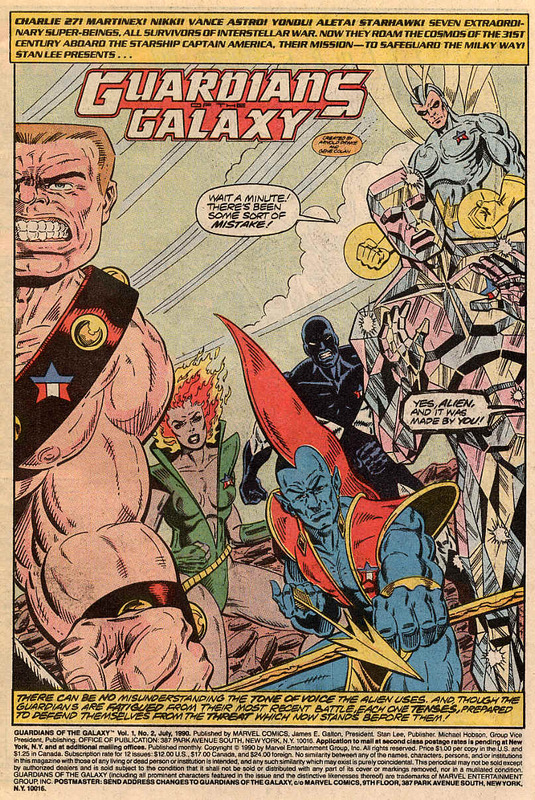 Valentino’s pencils defined the look of this sci-fi superhero series, giving it a distinct visual style, much of which remained for the rest of the series. It is as a writer however, that Valentino made the largest impact. With different writers writing them in different years and for different purposes, characterisation was something of an afterthought. 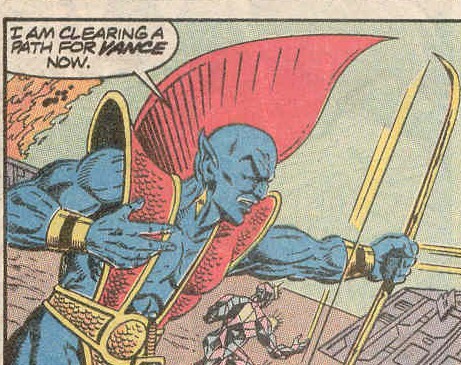 But here in their own title Valentino allowed the characters to grow and change from their first few guest star appearances..
Vance Astro was bitter and self pitying, trapped in his preservation suit, but over time, Valentino brought out his nobility and a commanding presence. Charlie-27 went from being a clichéd team bruiser to a military thinker with a gentle heart and a thirst for adventure. Martinex was a cautious thinking man, ill at ease with the leadership role he’d been thrust into. Nikki was no portrayed as an angry girl, who lept into swashbuckling adventure to escape the trauma of her past. Aleta was a gentle and caring character. Starhawk changed both the most and the least. By using a more faded colour palette and distinct dialogue boxes, Starhawk is made to feel more alien and almost comes across as a hologram. This along with the secret of his being “One Who Knows” didn’t make him a more likeable character, but like the rest, he became a fully formed and interesting one. 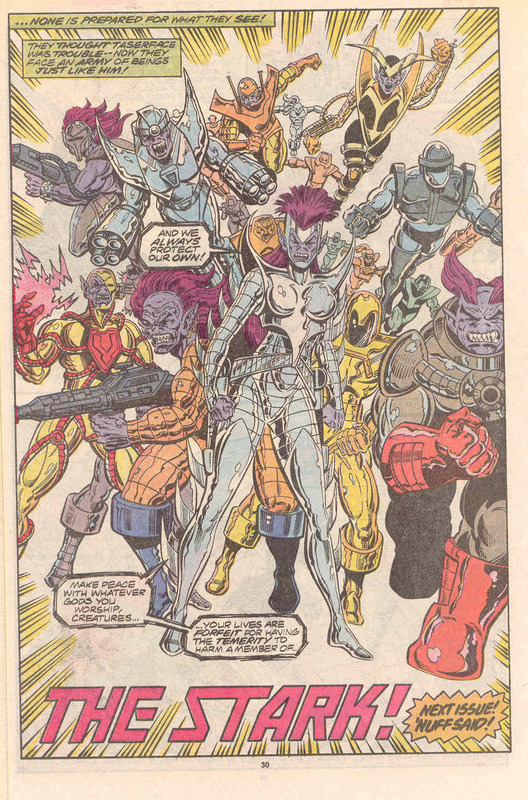 But are they ready for Taserface.. Was written and pencilled by Jim Valentino, was inked by Steve Montano, lettered by Ken Lopez, coloured by Evelyn Stein and edited by Craig Anderson, with Tom DeFalco being editor in chief. 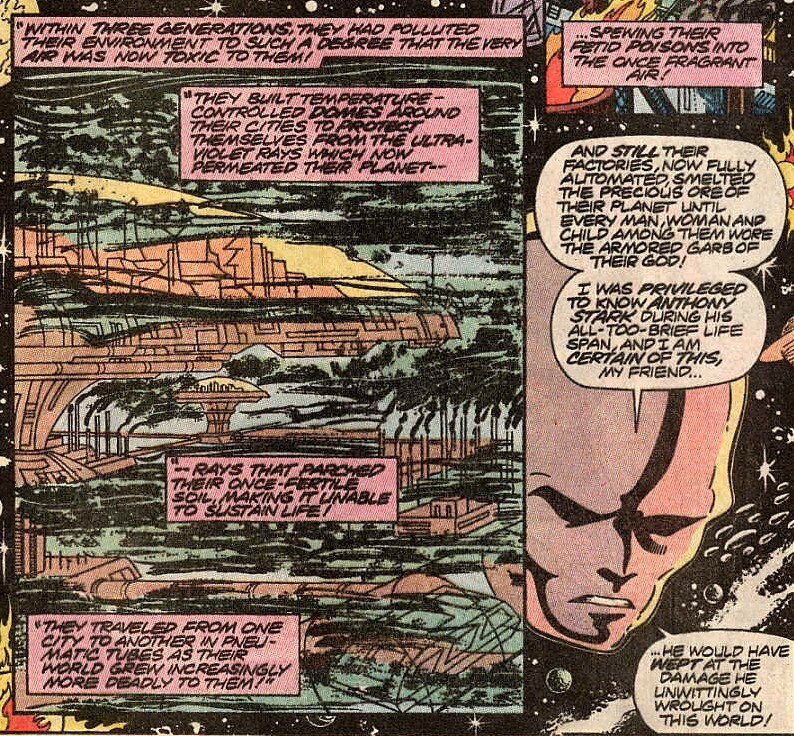 The story opens with the Guardians of the Galaxy visiting the planet Courg a low tech world in the Bledsoe system and being almost immediately fired upon by some kind of automated weapons installation. The Guardians are each showcased dealing with this attack, giving those who hadn’t seen the Guardians before a quick guide to who they are, where they’re from and what they can do. The team make quick work of the automated weapons, but an alert is raised off world. The crisis seemingly over, the Guardians begin to explore Courg. They try to get information from a group of natives, when one of them attacks Yondu crying murderer as he does so. Yondu safely disarms the Courgan and mentally shaken by this event teleports to their orbiting ship, the Freedom’s Lady, along with Martinex. Charlie-27 tries to get Nikki alone, with her pointing out that his burns from last time haven’t healed, which Starhawk exchanges with Aleta. Back on the ship, Yondu prays to his people’s God, Anthos. When Martinex is ready to go back down to Courg, Yondu ask him to join him in a vision. 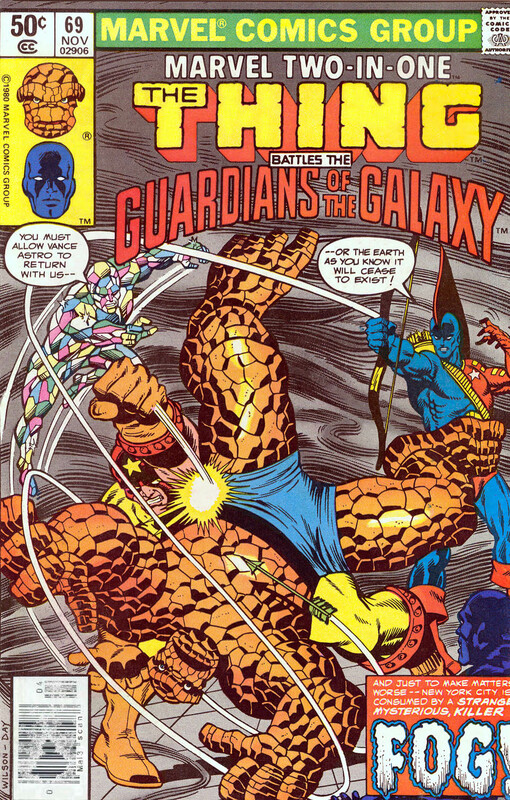 What follows is a brief history of the Guardians of the Galaxy, including their origin, their 70’s marvel appearances, the Korvac Saga and their return to the 31st Century. He reveals that they decided after it all to stay together and they found the Centauri artifact, the book of Antag. Inside the book was reference to a disk shaped device that Vance recognises as Captain America’s shield. This started the team looking for it on several different worlds and as yet, had no success. Martinex and Yondu return to the rest of the team and Vance suggests that the reason they found nothing is that others are on the same search and are ahead of them. This would explain the natives’ response to Yondu. As they debate this an armour creature with purple skin appears from nowhere demanding they leave Courg or die at the hands of Taserface. No, that wasn’t a typo, he’s called Taserface. He quickly blasts Vance across the floor. 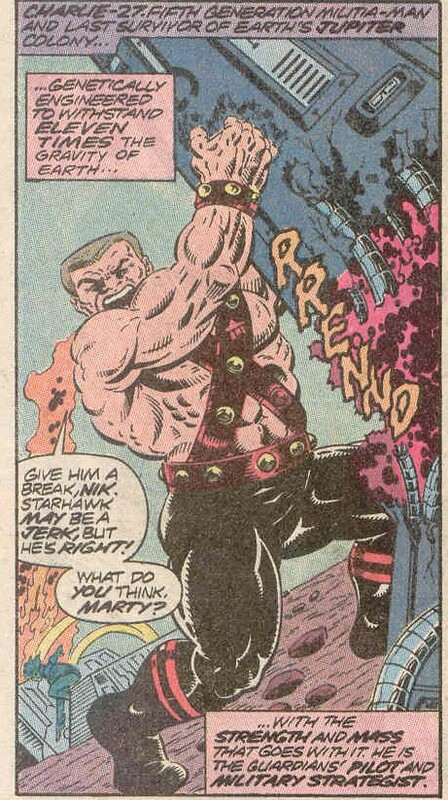 The rest of the team doesn’t fare much better and it’s not until Martinex asks Aleta to change places with Starhawk and the tide turns. 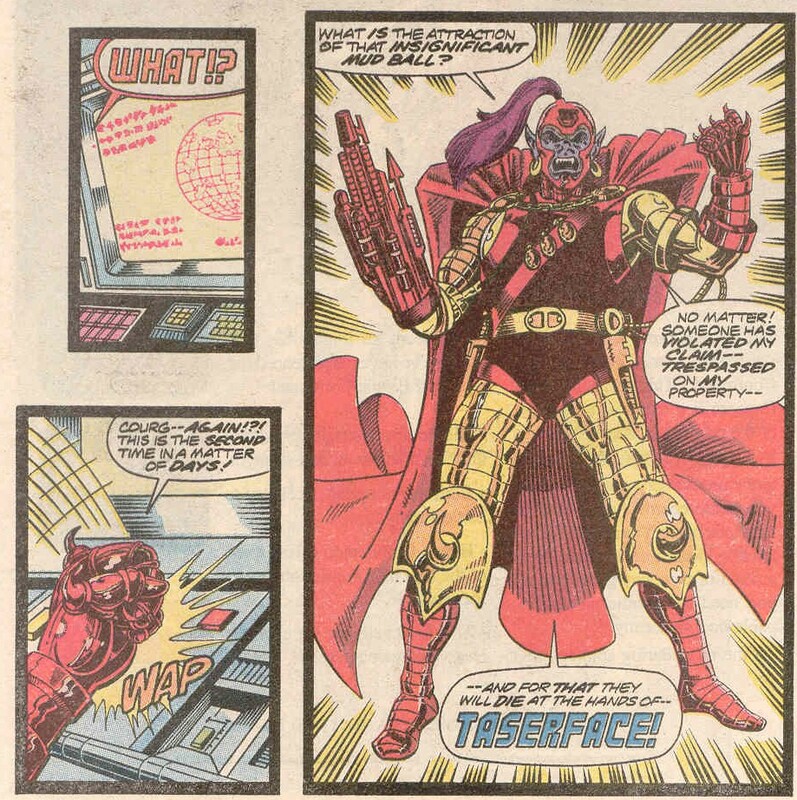 Once Taserface is on the floor, Vance notes that his armour is kind of like Iron Man’s and they wonder who or what he is. The answer is quickly forthcoming. Appearing as quickly as Taserface did are a group of similiar creatures calling themselves the Stark. Immediately it’s noticed that Yondu, Nikki, Aleta and Charlie-27 are all in new costumes, mostly an improvement. Martinex has now become team leader and the team is on a quest to find something and this something links them once again to the 20th Century. Nikki is no longer pursuing Vance and seems to be being pursued by Charlie-27. Aleta seems quite upset when Vance is hurt. The team seems to be more cohesive than in the past, but there is still tension between the members, most of which are the last of their respective races. Valentino’s pencils and words are what makes this issue shine in my eyes. His versions of the characters are to me their definitive looks. I loved this issue and am glad that I’ve got to this point. Marvel Two-in-One 69 was cover-dated November 1980 and was on sale August 1980, sharing the spinner racks with Flash #291, Ghost Rider #50, House of Mystery #286, Moon Knight #1, New Teen Titans #1 and Thor #301. 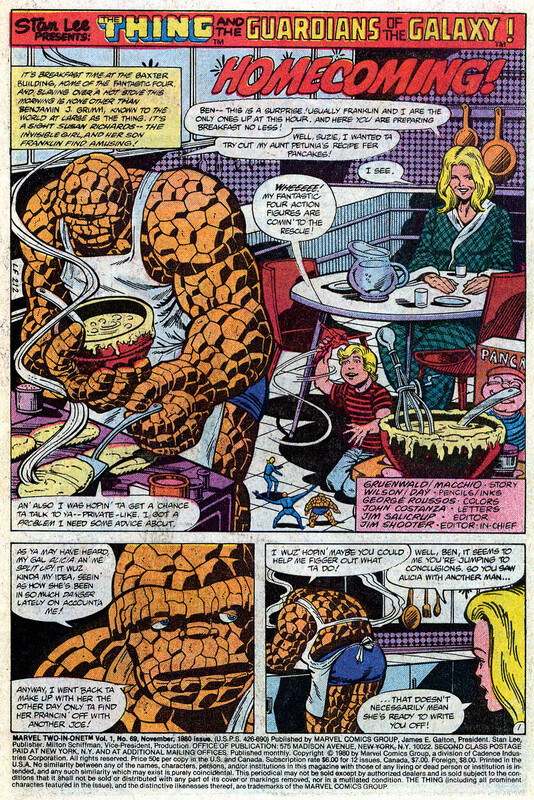 Homecoming was written by Mark Gruenwald and Ralph Macchio, with pencils by Ron Wilson and opens with Ben ‘The Thing’ Grimm and Sue ‘Invisible Girl’ Richards talking in the Fantastic Four’s kitchen in the Baxter Building. Ben is making pancakes for Sue and her young son Franklin, who is sitting there playing with toys. Ben is griping about relationship problems with Alicia when Starhawk of the Guardians of the Galaxy teleports onto the kitchen table. 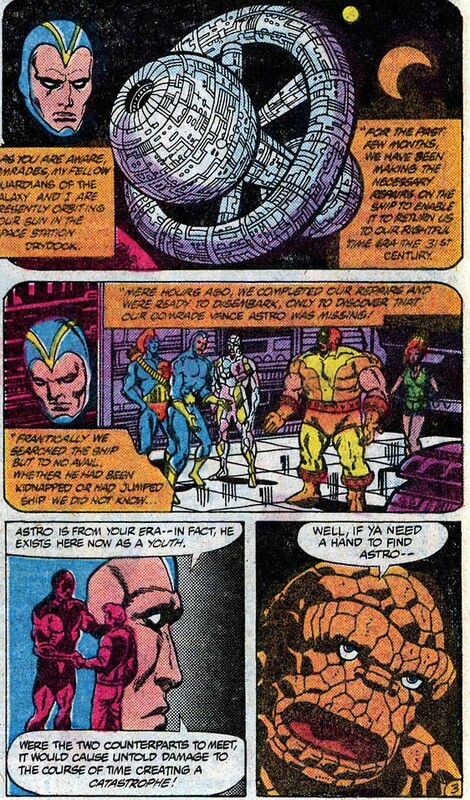 Starhawk tells Ben that Vance Astro has vanished from Drydock, just after the repairs have been completed to allow the team to return to the 30th Century. This is a problem since Vance is over 1,000 years old, there is a younger version of himself in Saugerties New York called Vance Astrovik and if the two meet, there could be time related catastrophe. Turns out that is exactly what is happening. 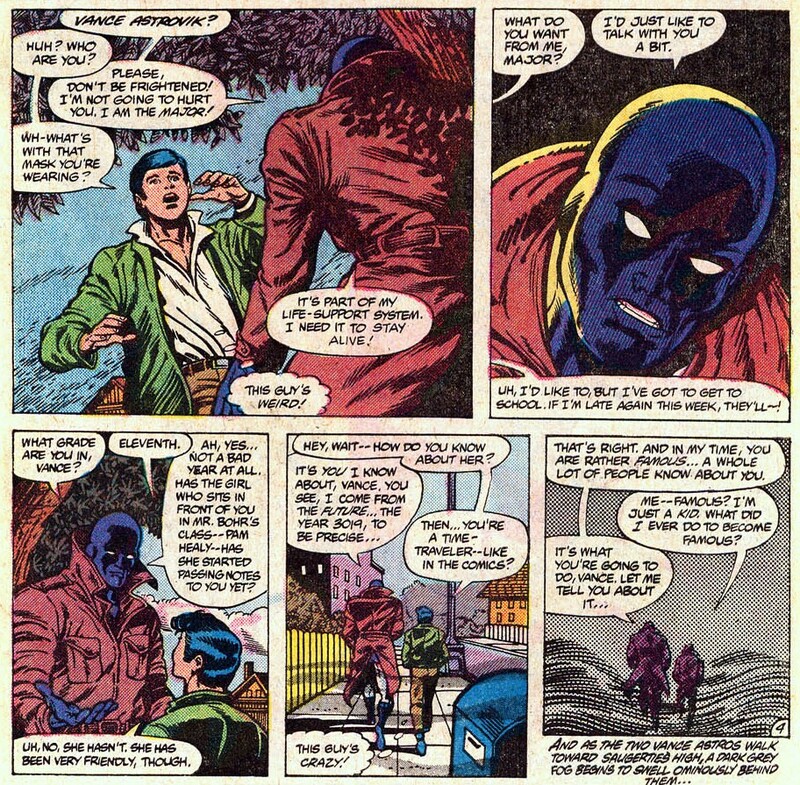 Vance Astro ambushes his younger self and then proceeds to warn him about the life he will live if he continues on this path to be an astronaut. As this is happening a large thick fog begins to blanket the New York area. The Fantastic Four investigate and after learning that this is no ordinary fog, Ben lands a portion of the Fantasti-car and checks out what’s happening at the fog’s centre. 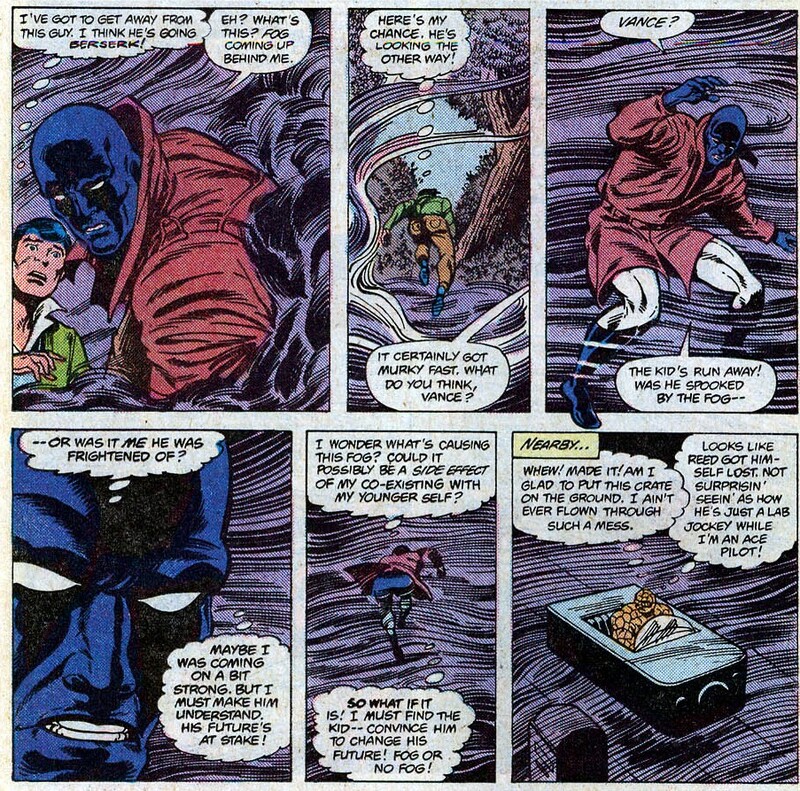 Vance Astro is distracted by the increased fog, giving young Vance a chance to escape. 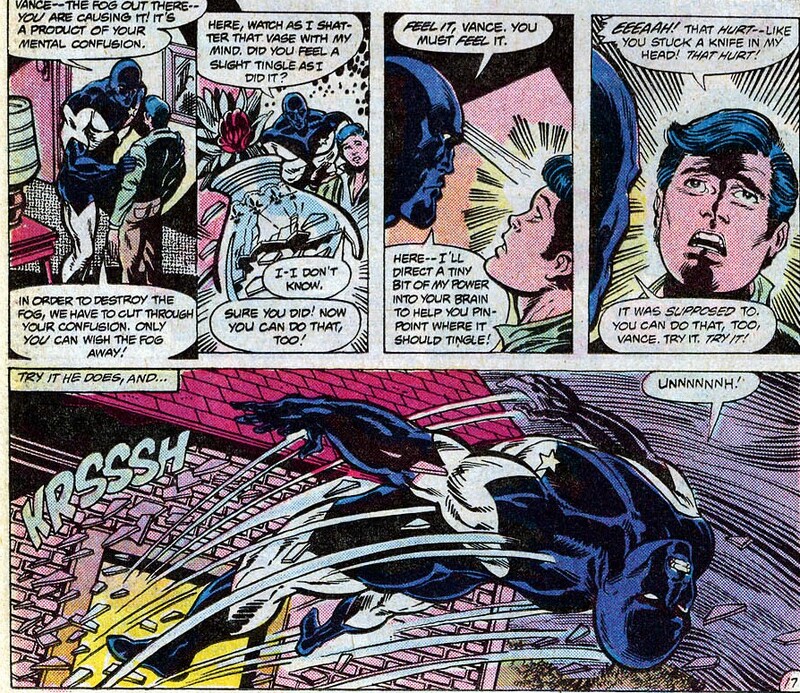 Vance Astro gives chase until Ben catches up with him. Vance says that he’s trying to stop the younger Vance from being an astronaut, thereby altering history. Ben tells him that that idea won’t work, since he’s tried it himself. Vance asks that Ben help him try again and Ben agrees. Having met himself before, Ben doesn’t see the temporal catastrophe as being as likely as Starhawk does. At the Astroviks’ home, Vance tries to find his younger self and only finds Charlie-27, Martinex and Yondu. After a brief tussle, Martinex freezes Vance’s life support suit, meaning he cannot move without risking tearing it and ending his own life. Ben tackles Charlie-27 and beats him and whilst Yondu keeps Ben at bay with one of his special Yaka arrows (called Yucca arrows here) the Guardians retreat, confident that the fog will now lift. 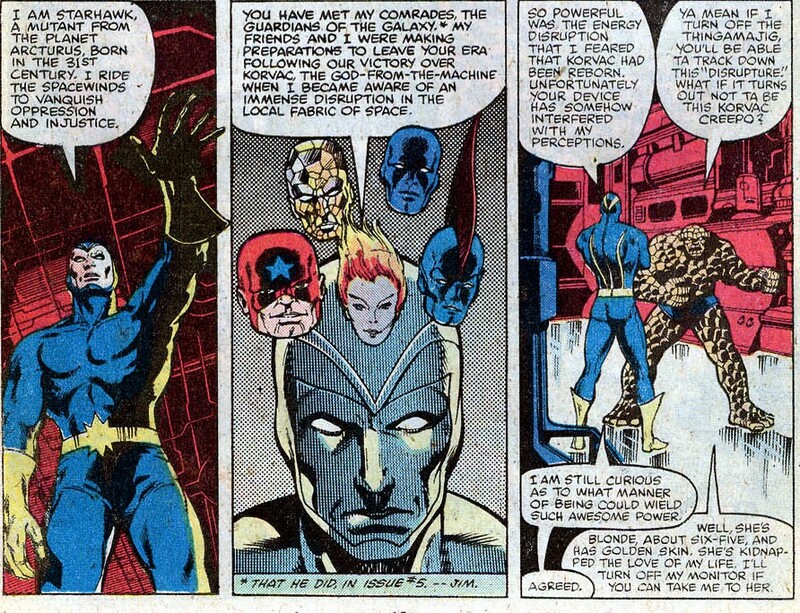 But it doesn’t, the problem is that Vance Astro and Vance Astrovik have identical mutant brains and the fog is likely to be young Vance’s powers manifesting. The Guardians return to the Astroviks’ and try to trigger young Vance’s powers. That works and young Vance develops strong telekinetic powers. 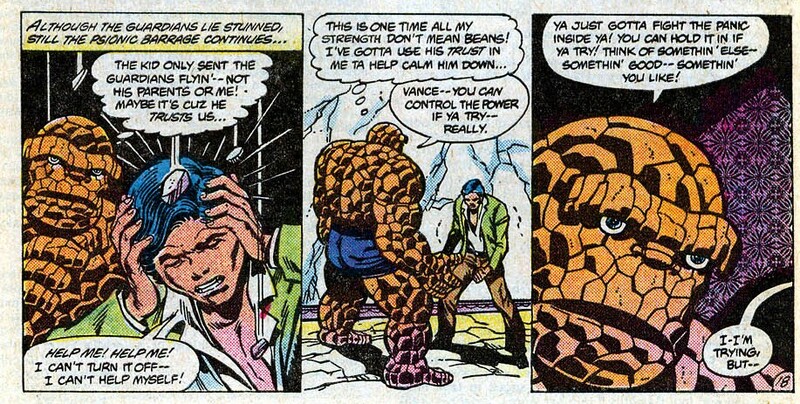 The Thing talks young Vance down and the crisis seems to pass. Just as the Guardians are about to leave, Vance Astrovik’s father walks over and berates Vance for ruining his son’s life. 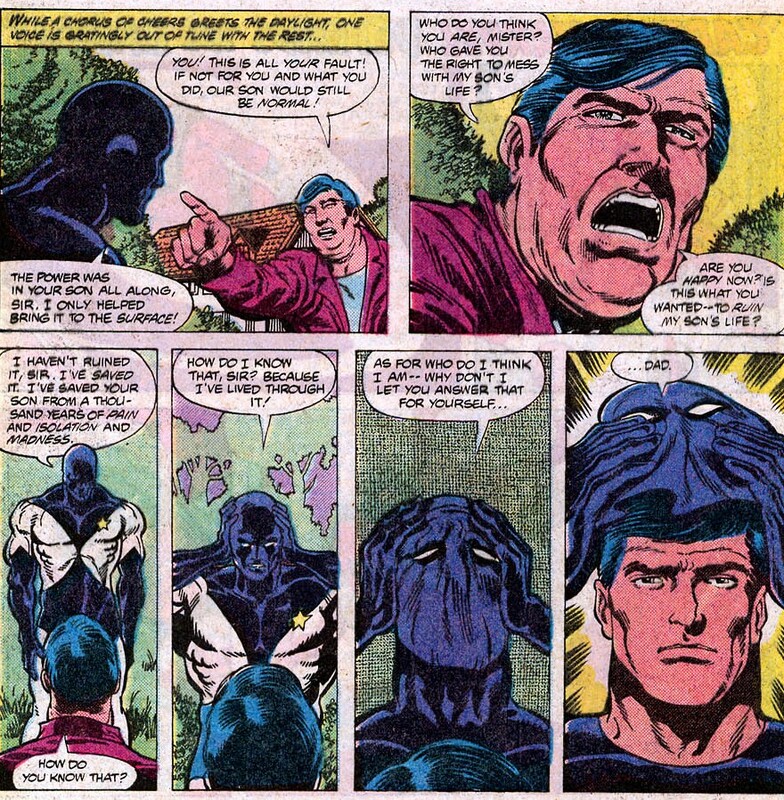 Vance Astro in a fit of pique, pulls off his mask to show Vance’s father that he’s his father too. He immediately puts it back on and leaves. The team returns to Drydock. When asked by Nikki whether or not it was worth it, Vance points out that in one reality, he didn’t become a Guardian and that was enough. Notes: This is one of those issues that is more important than good. 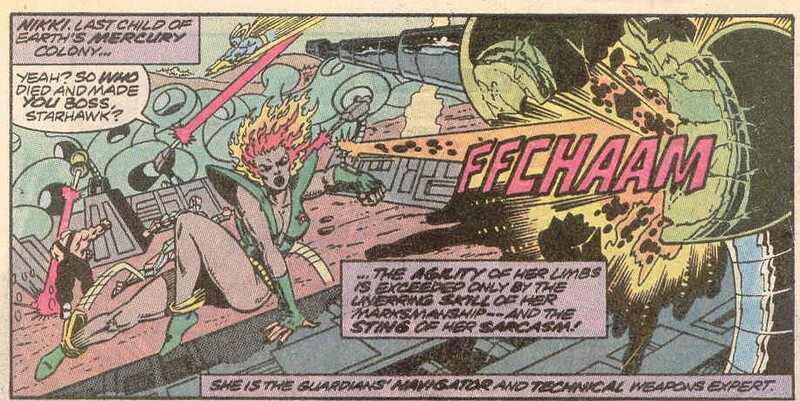 This one act seperates the marvel universe, from the reality of the Guardians of the Galaxy. From this point, anything can happen. Vance Astrovik doesn’t become an astronaut, in fact he becomes a superhero. 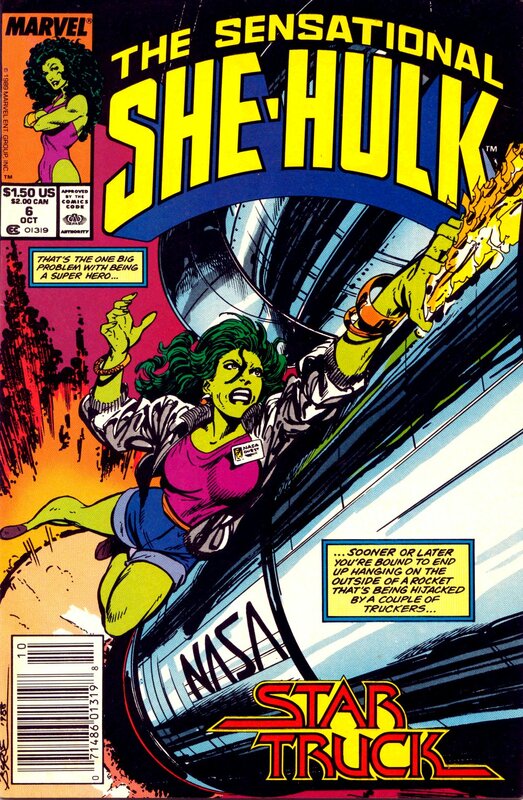 The Guardians of the Galaxy leave the 20th Century and return to their own time and only had one other cameo appearances between November 1980 and June 1990 and that was in Sensational She Hulk 6, from October 1989 written and drawn by John Byrne. 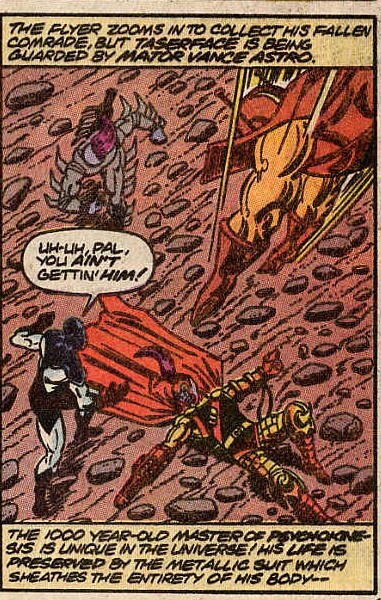 It’s a one panel cameo of the Guardians getting directions and that was that. 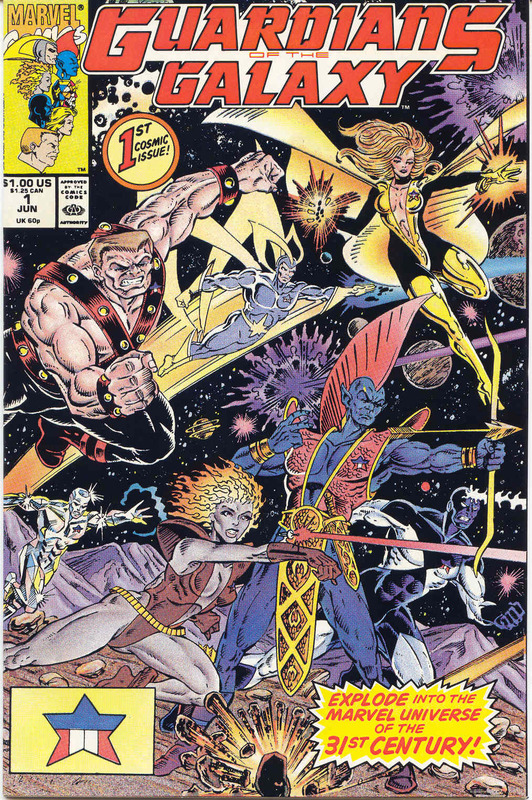 The Guardians of the Galaxy would return in June 1990, but that is for another day. The Guardians guest star days are over and the epic is about to begin. Marvel two in one 63 was cover-dated May 1980 and was on sale February 1980, sharing the spinner racks with Batman #323, Captain America #245, Justice League of America #178, Man Thing #4, Sgt Rock #340 and Spider-Woman #26. 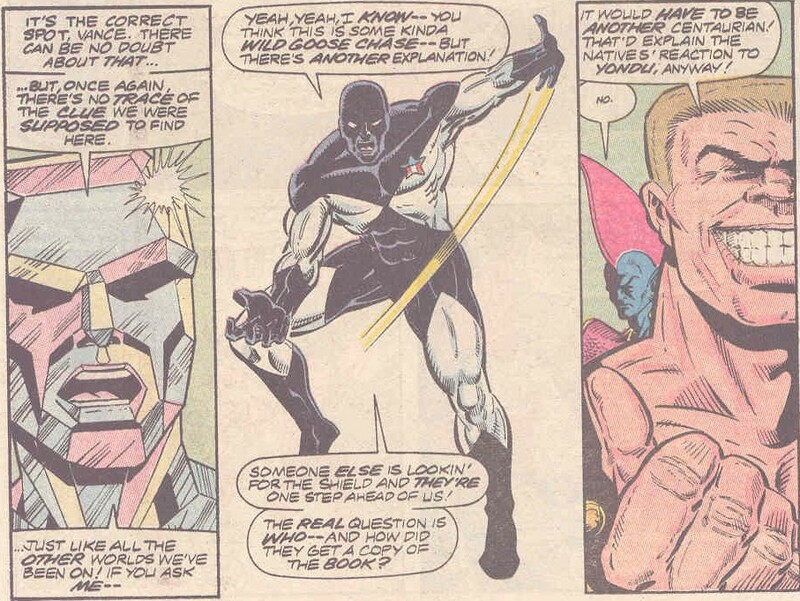 Suffer not a Warlock to Live was written by Mark Gruenwald and pencilled by Jerry Bingham and opened with the High Evolutionary located the stolen Counter Earth. He finds the planet having been towed, yes that’s right, towed out of the solar system by a fleet of ships. Seeing this with him are The Thing, Alicia Masters, Moondragon, the being known as Her and Aleta, who promptly turns back into Starhawk. 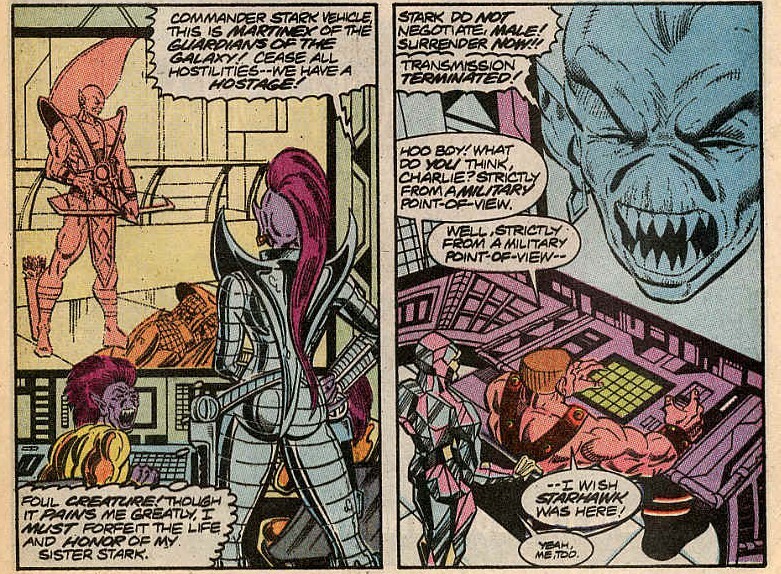 Starhawk volunteers all but the High Evolutionary to go over to one of the ships as an expidition. 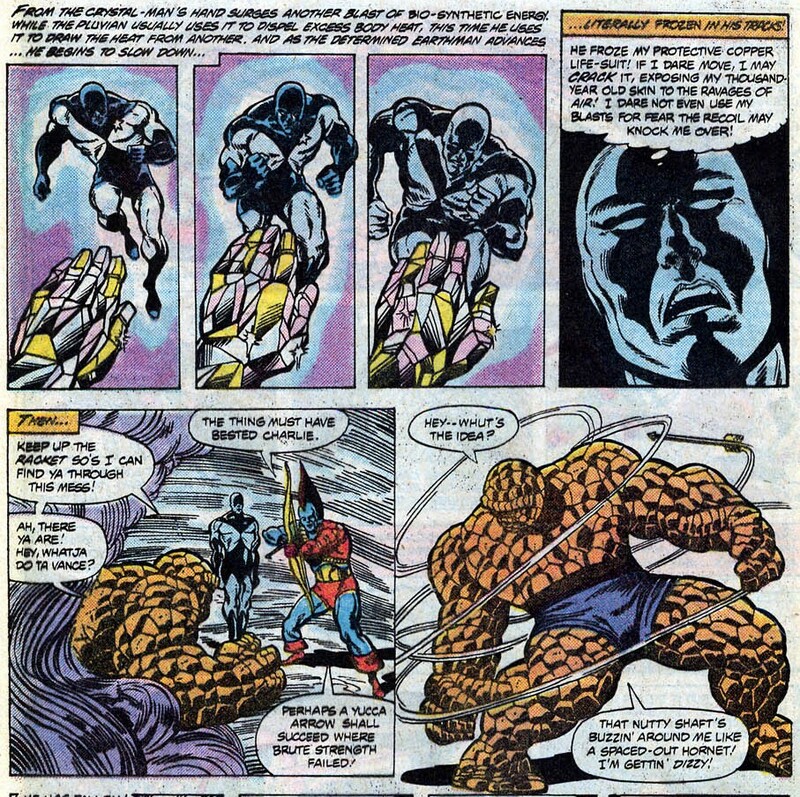 The Thing flatly refuses, not wanting to put Alicia into any unnessary danger, Starhawk reluctantly agrees and takes Her and Moondragon with him. The three are beamed over to the ship and find several giant beings who don’t seem to speak english. This being a Marvel book, there’s a fight. This is a brief fight and soon the remaining three are beamed over as well. 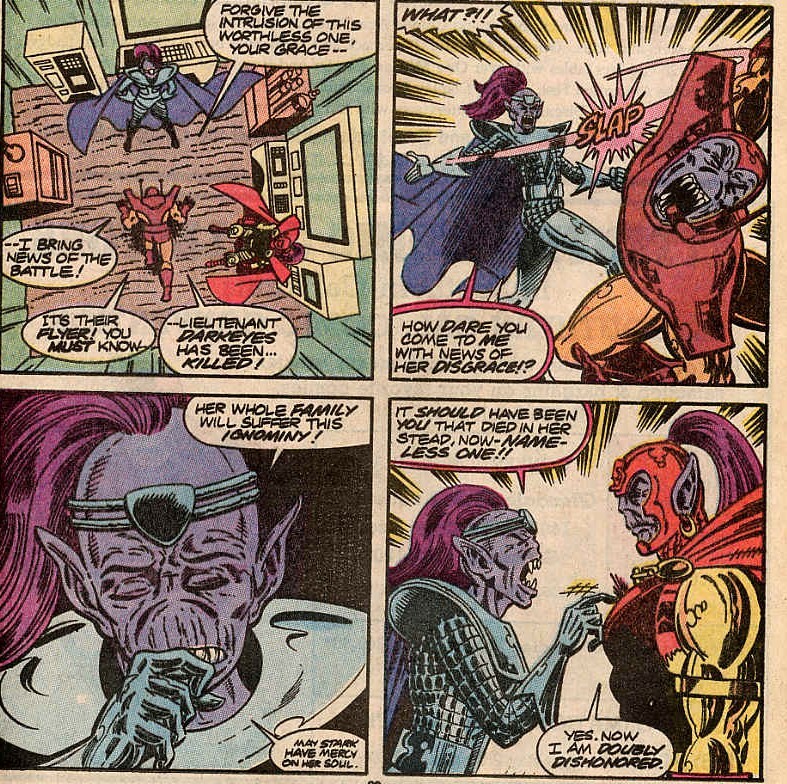 A new giant alien appears, this one knowing english well, allows the High Evolutionary to grow in size and communicate with him rather than Starhawk and Her pick another fight. 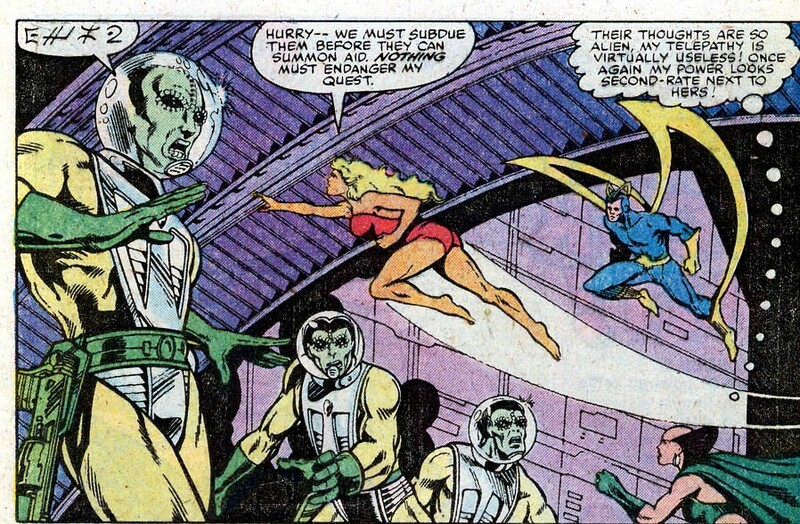 The aliens are ring shippers, contract to move of Counter Earth, by a race called the Beyonders (unrelated to the entity at the heart of Secret Wars) the english speaking creature calling himself Sphinxor, explains that they have tried several times to remove an obstacle to their claiming of Counter Earth, the same person that Her is looking for Adam Warlock. Sphinxor tells them that they’ve tried illusions and awoken vampiric appetites within the soul gem to keep Warlock from interfering. 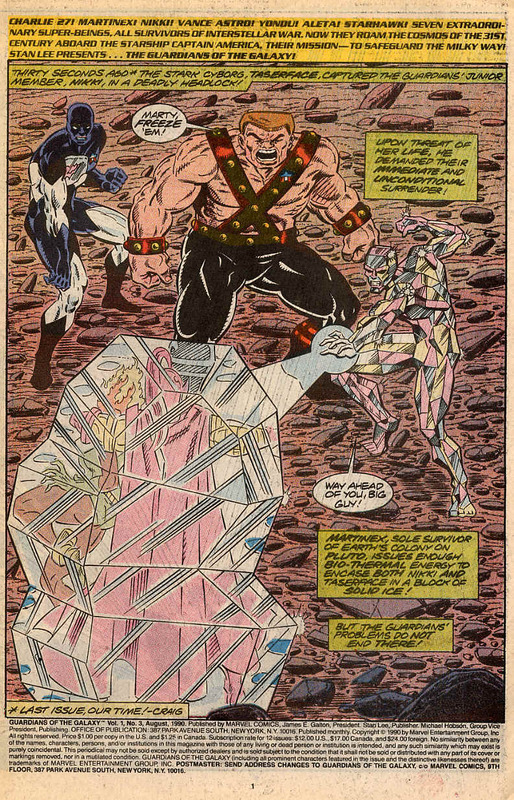 One of the illusions led him to attack the High Evolutionary (as shown in MTIO #62) and leaving local space, allowing the ringshippers to claim the planet. 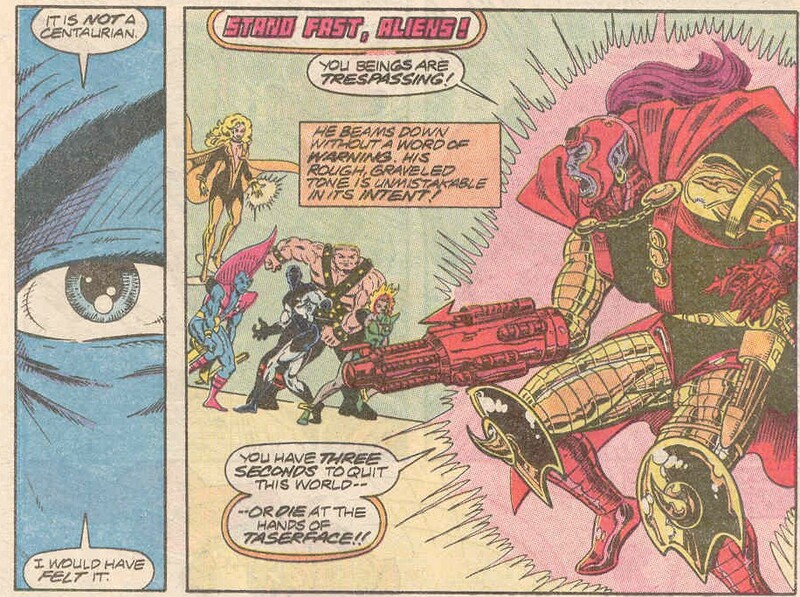 The High Evolutionary then drops a bombshell, the planet is unstable. If the Beyonders can save it, he will allow Sphinxor and his people to continue the move on two conditions, one that he comes with them and two, that the rest of the group are able to go down to the planet. Sphinxor denies the second request, until the Thing points out that he and the rest could destroy the ships and all aboard if they do. Once on the planet, Her finds the grave of Adam Warlock and restores life to his body, the same way she restored the High Evolutionary. The difference here is that the spirit of the High Evolutionary was nearby his armour and Adam’s soul resides in the soul gem, held by the Gardener, one of the Elders of the Universe. A heartbroken Her sheds tears as the Thing tries to comfort her. She then abruptly flies away, leaving the other four ready to move on after Alicia waxes lyrical about love. Notes: An odd story, seemingly tying up lost threads of older Warlock stories, putting a full stop on Warlock’s story and Counter Earth. Maybe it was testing the waters to see if there was any value to bringing Warlock back. Starhawk is almost completely unnecessary to this story and the Silver Surfer or someone like that would’ve worked just as well, but his presence was enough to get me to find and read these issues and am glad I did. 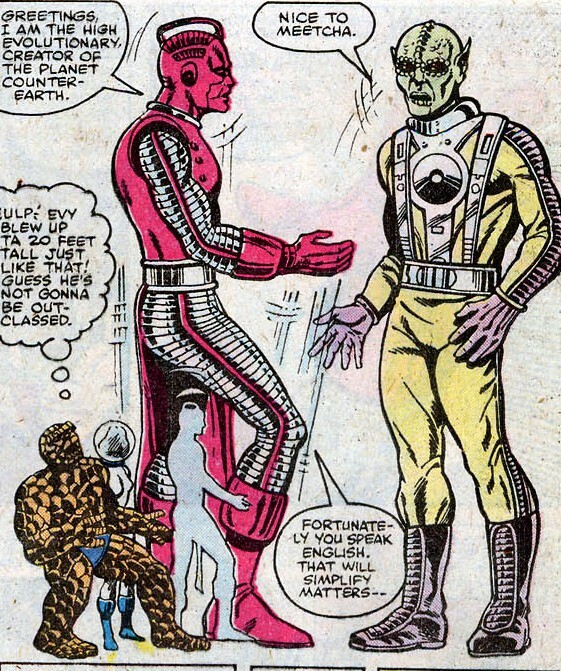 The next appearance of the Guardians is in Marvel Two-in-One 69 which brings an end to their guest star nature and their 20th Century adventures as far as I know. Come back soon. Marvel Two-in-One 62 was cover-dated April 1980 and went on sale January 1980, sharing the spinner racks with DC Comics Presents #20, Conan the Barbarian #109, Legion of Superheroes #262, Star Trek #1, World’s Finest #262 and X-Men #132. 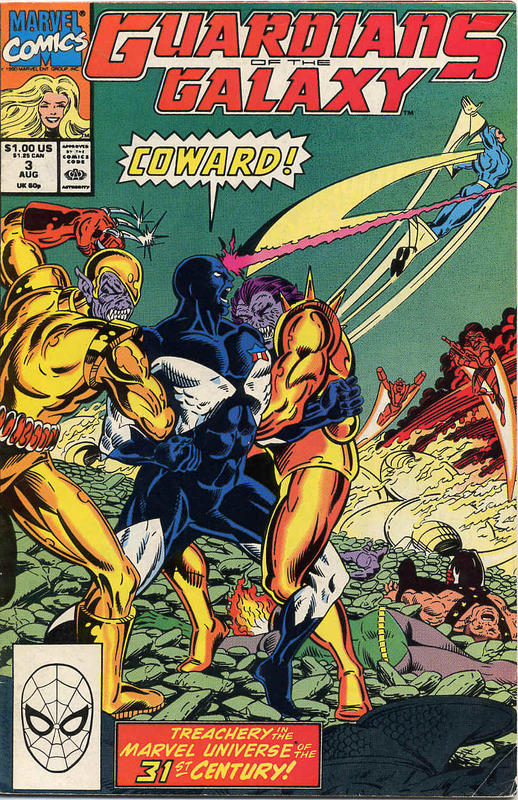 The Taking of Counter Earth was written by Mark Gruenwald and drawn by Jerry Bingham. 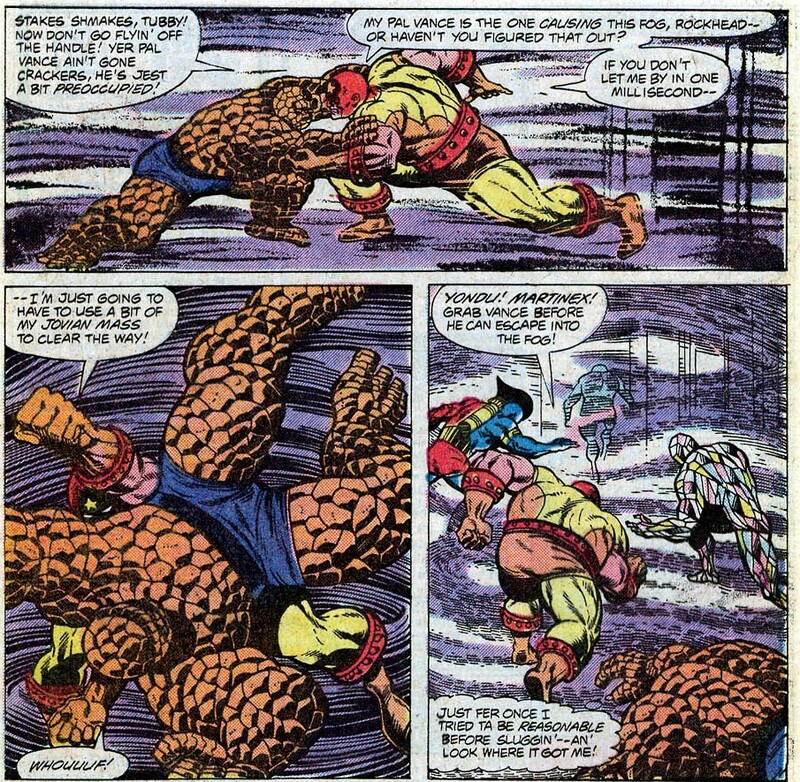 And opens with The Thing taking Starhawk back to Baxter Building to recover from the attack of Moondragon and the being known as Her. 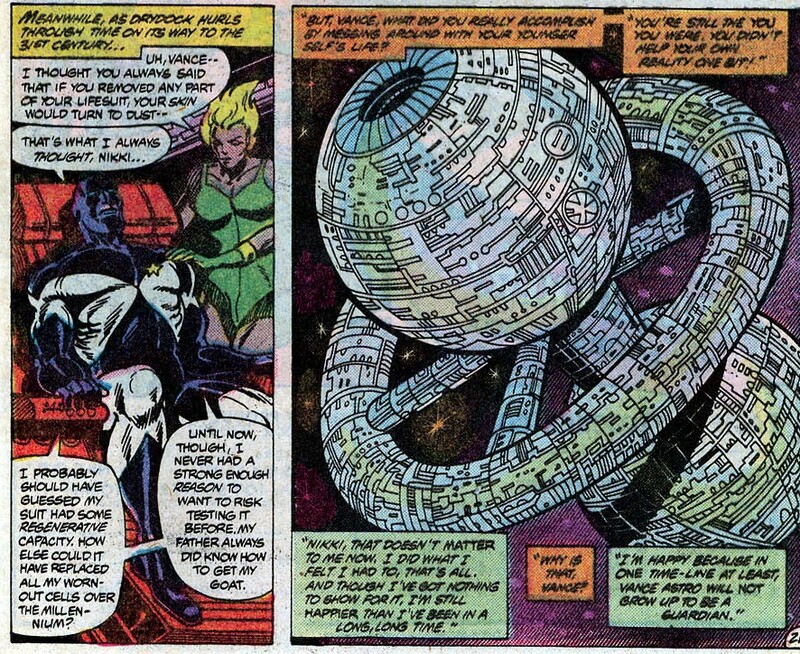 With Moondragon’s ship having less than 15 minutes lead on them, the two heroes use a Skrull saucer once captured by Reed Richards, Thing’s team-mate in the Fantastic Four and give chase. 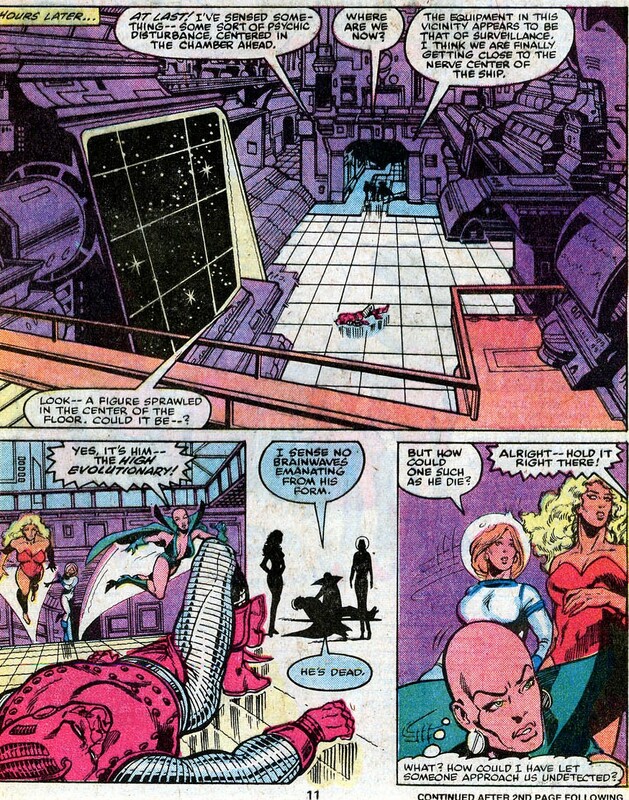 On Moondragon’s ship, Moondragon tells Her of Adam Warlock’s adventures on Counter Earth and how that led to him being buried there. When they reach Counter Earth’s location on the opposite side of the sun from Earth, they find that it’s gone. 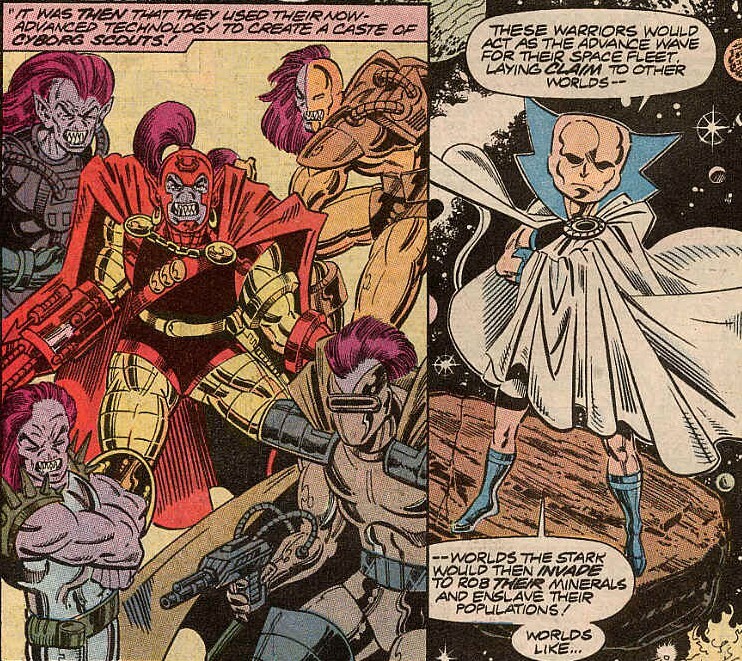 Counter Earth’s moon however, is still there and once Her changes Alicia’s clothes into a spacesuit and the three go in search of the High Evolutionary, the creator of Counter Earth. 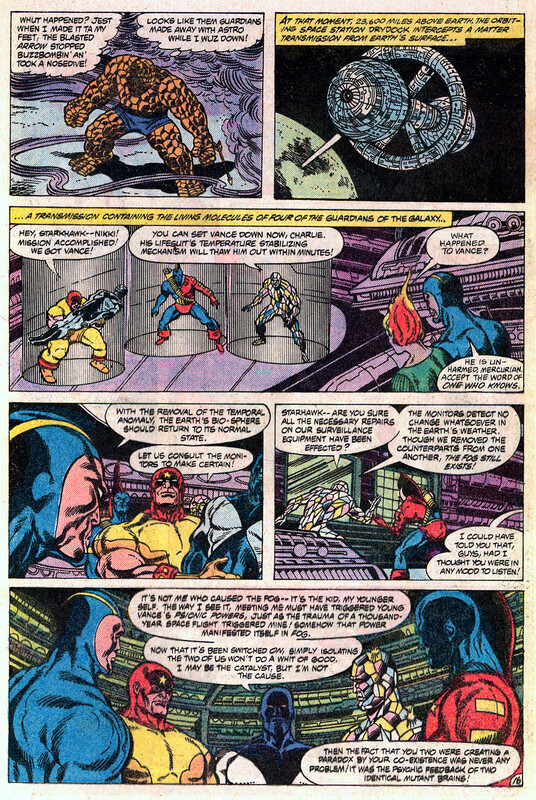 The three find the still body of the High Evolutionary and just as they do, The Thing and Starhawk arrive and a fight ensues. 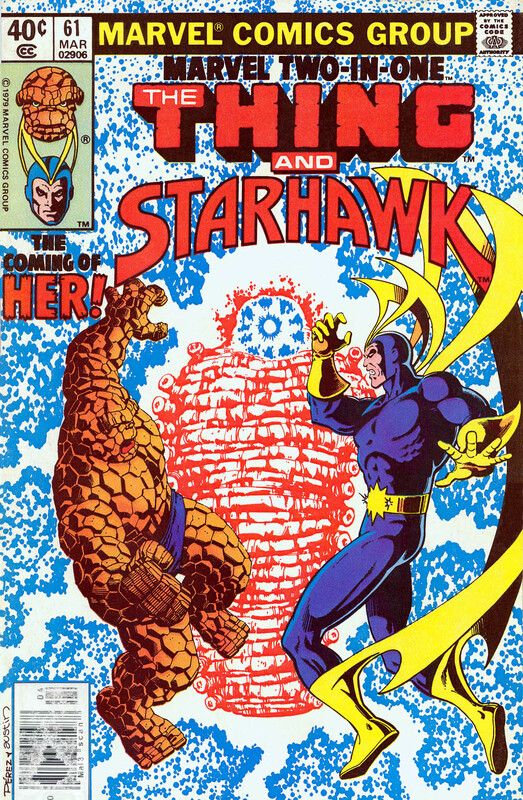 Starhawk faces Her and is faring well until he feels his wife Aleta, who shares his physical form, trying to take over. 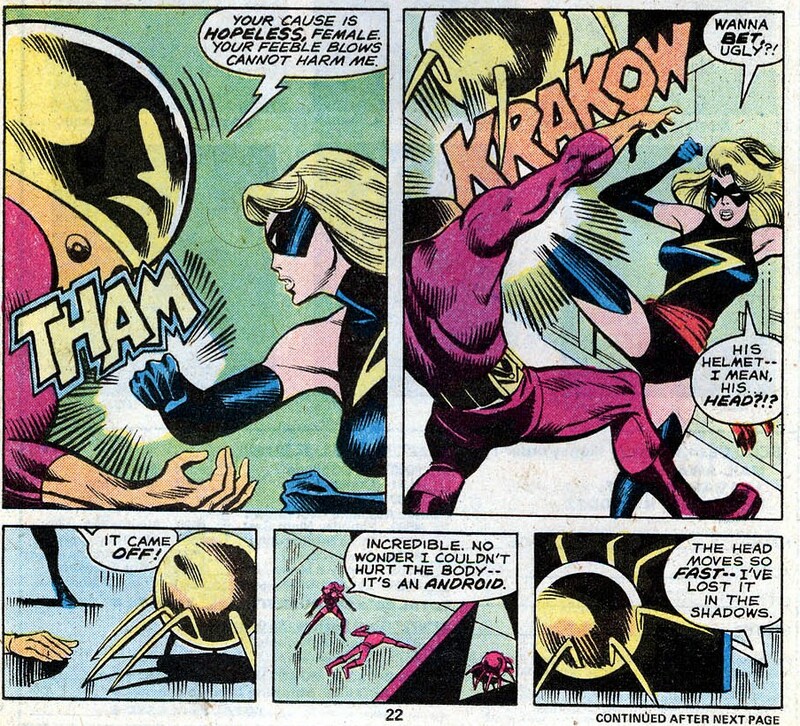 Moondragon feels she can earn Her’s respect by physically defeating the powerful Thing. As you can imagine, Moondragon fares less well. The cold and rational Starhawk can gain no ground against the equally calm Her, but when Aleta claims their sharing form, Her is caught unaware by the physical and savage attack and she is taken down. 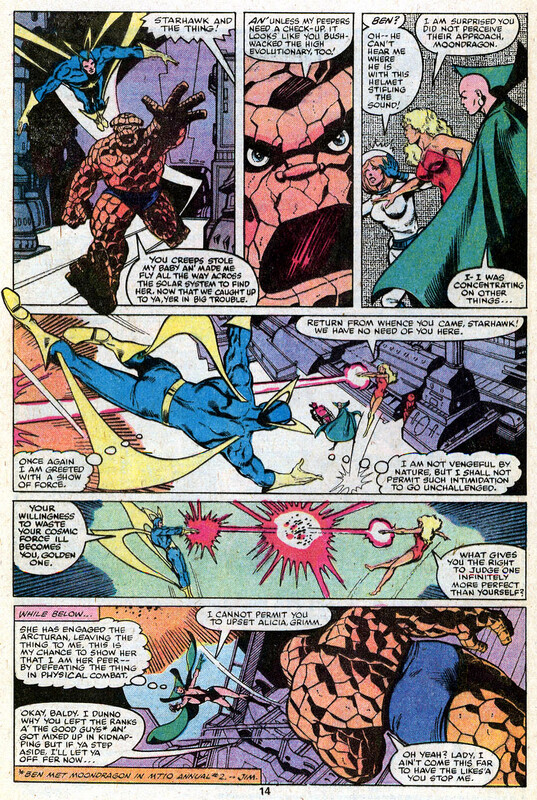 The Thing finds subduing Moondragon to be no challenge, then she tries and mindblast, toppling the Thing. 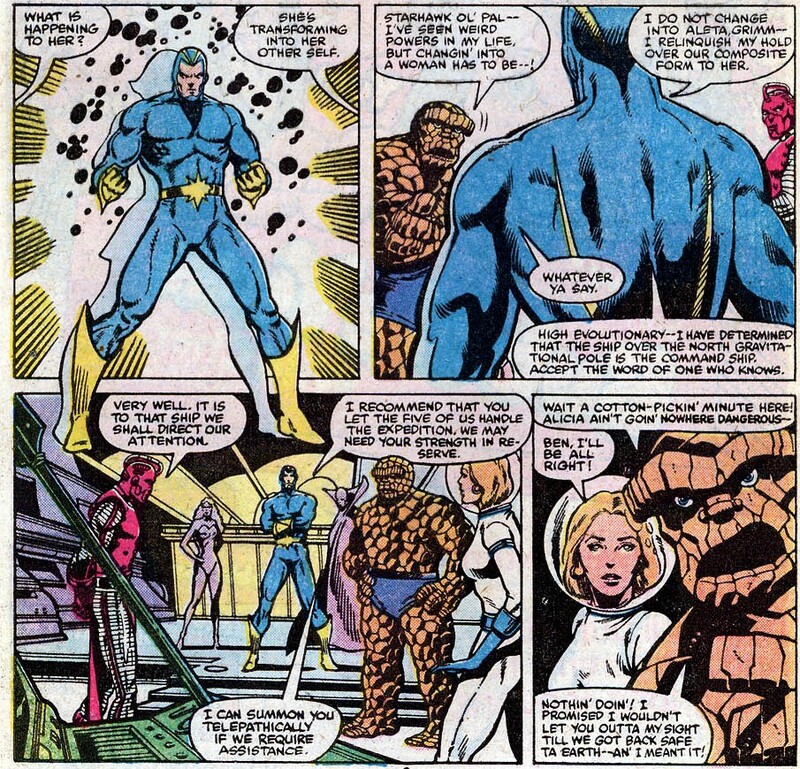 Alicia finally gets her helmet off and begins to talk sense into Moondragon and the Thing and then they all turn their attention to the body of the High Evolutionary. 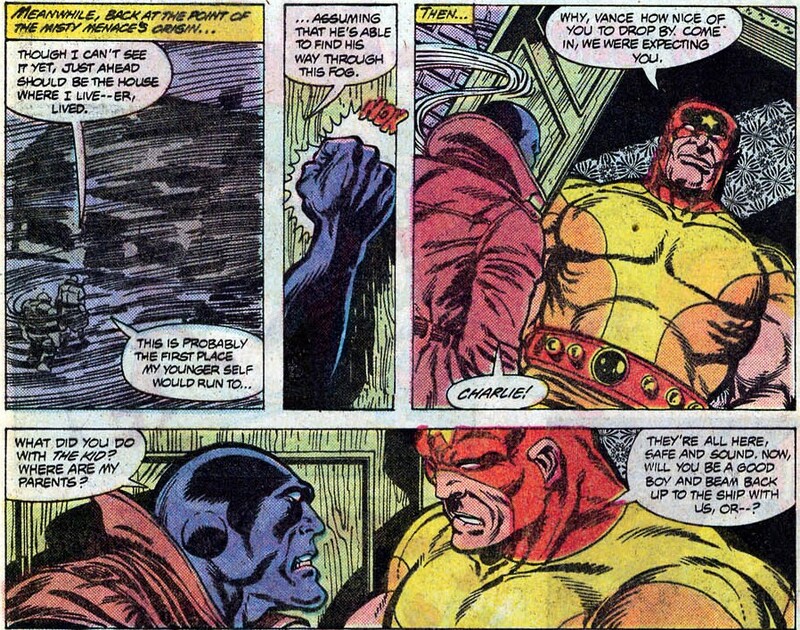 Moondragon senses that while his spirit is near, there is no actual body in there. 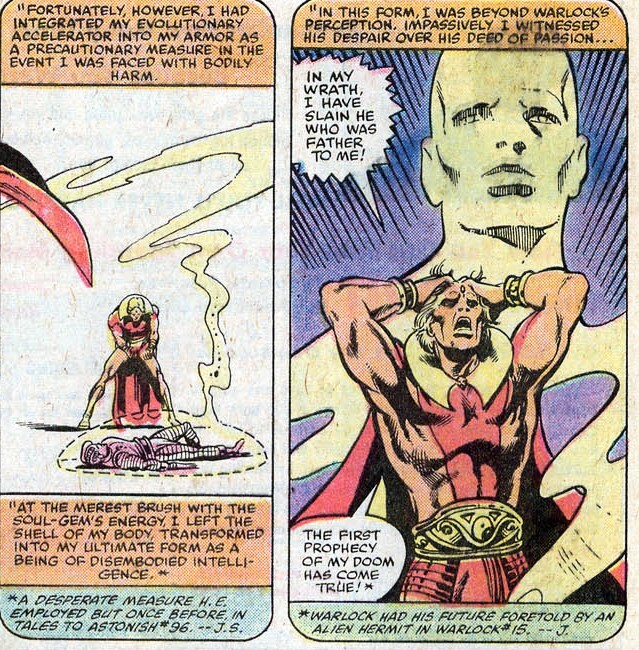 Her decides she can change this and using her cosmic power, restores the body of the High Evolutionary, who recounts his physical death at the hands of an enraged Adam Warlock. Warlock is screaming over the loss of Counter Earth, but the Evolutionary sees that Counter Earth is still there. Warlock kills his old ally with the soul gem and leaves. 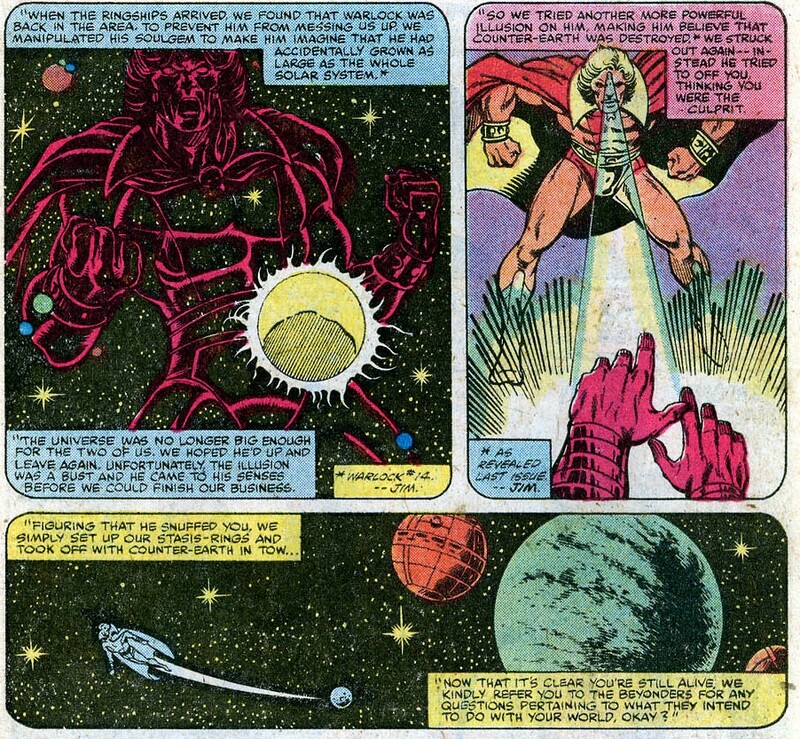 Now the High Evolutionary has been restored to a humanoid form and learns the final fate of Adam Warlock. Her tells him that she can restore him, once they find their body and the High Evolutionary learns that Counter Earth is now gone and the 6 of them all vow to find the missing planet. 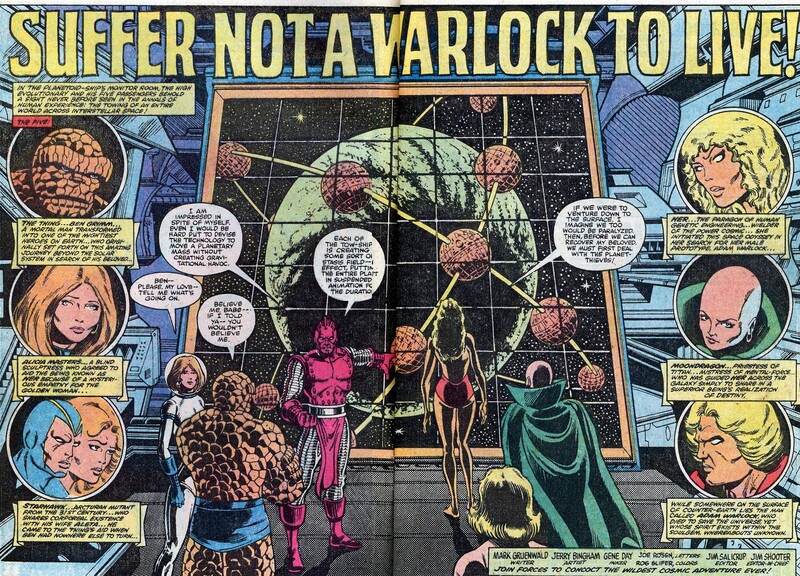 Next: Marvel Two in One 63: Adam Warlock? Marvel Two-in-One #61 was cover dated March 1980 and went on sale December 1979, sharing the spinner racks with Brave & the Bold #160, Fantastic Four #216, Flash #283, King Conan #1, Legion of Superheroes #261 and Rom Spaceknight #4. The coming of Her! 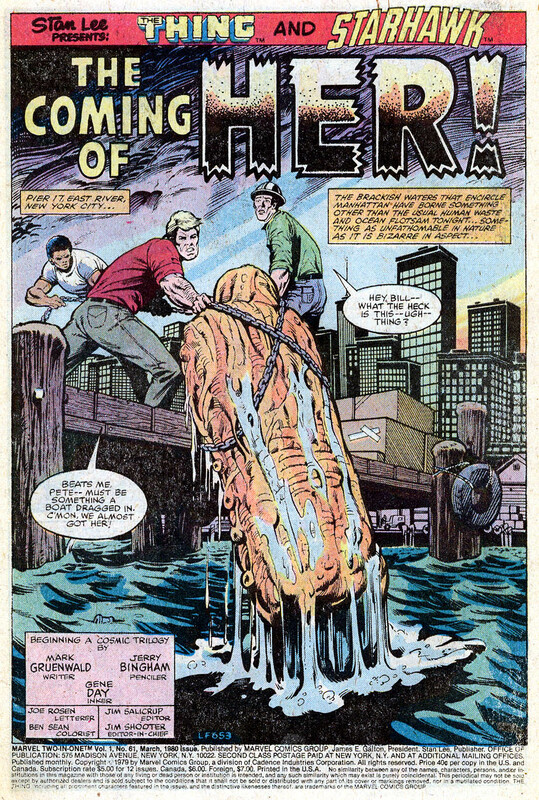 was written by Mark Gruenwald and drawn by Jerry Bingham and opens with a slightly larger than human sized coccoon being pulled from the river by some workmen. They examine it as it’s lying on the ground, then it begins to glow. It’s slit down the middle and a glowing figure emerges from the coccoon. This figure flies off into New York. In a fancy restaurant Benjamin J Grimm (A.K.A. The Thing) is out having a nice romantic dinner with Alicia Masters when the flying figure crashing through the skylight and lands facing Ben and Alicia. Ben reacts as he also does with a cry of “It’s Clobbering Time!” and is promptly blasted across the room by this being, departs with Alicia. The two of them land in a park and the strange golden woman gives her origin to Alicia. She was created by a trio of scientists, but went into her coccoon after ending the plans of those scientists. 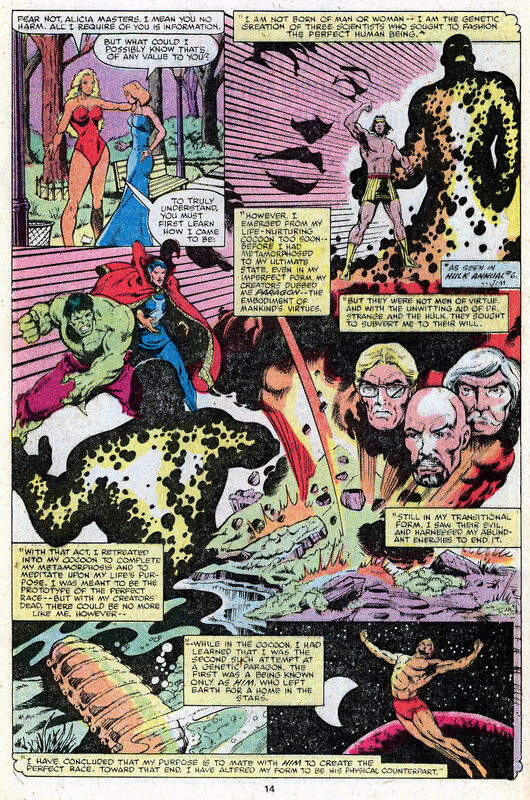 Whilst in her coccoon, she learns of another being like her, Him, who by this point was being called Adam Warlock. She decides that her destiny is to mate with him and produce a perfect race. She took Alicia, since Alicia was one of the first people to meet Warlock, but Alicia points out that she hasn’t heard anything about him in months. 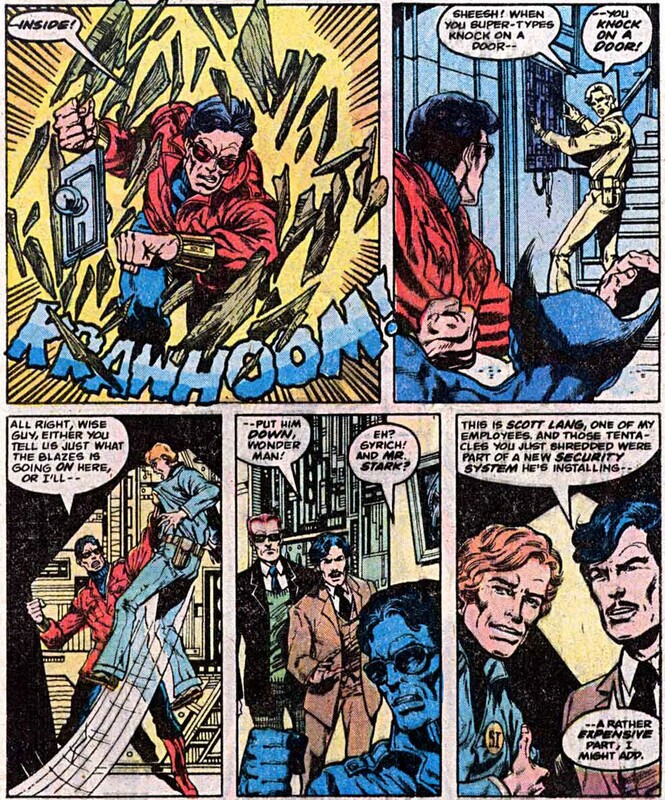 Ben arrives at the Baxter Building and tries to contact anyone who can help him and as he is doing so, is approached by Starhawk. 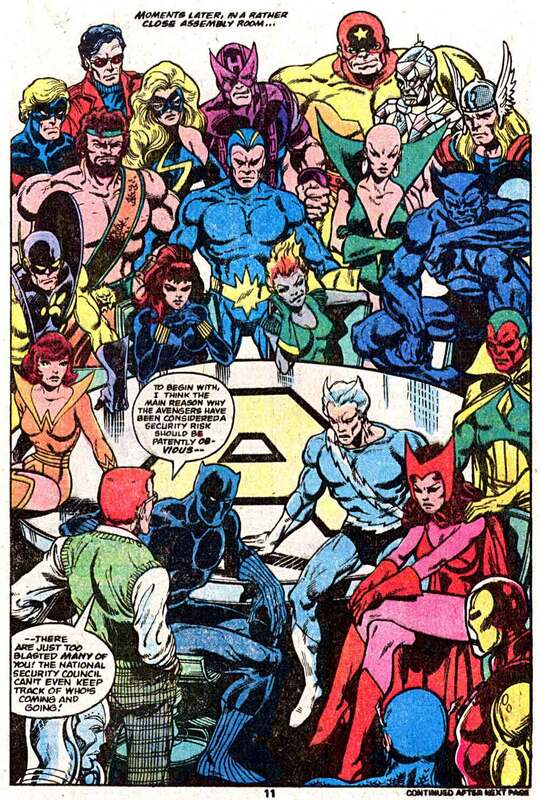 Starhawk explains that his team, the Guardians of the Galaxy were preparing to leave the 20th Century when he sensed a powerful disruption in spacetime. 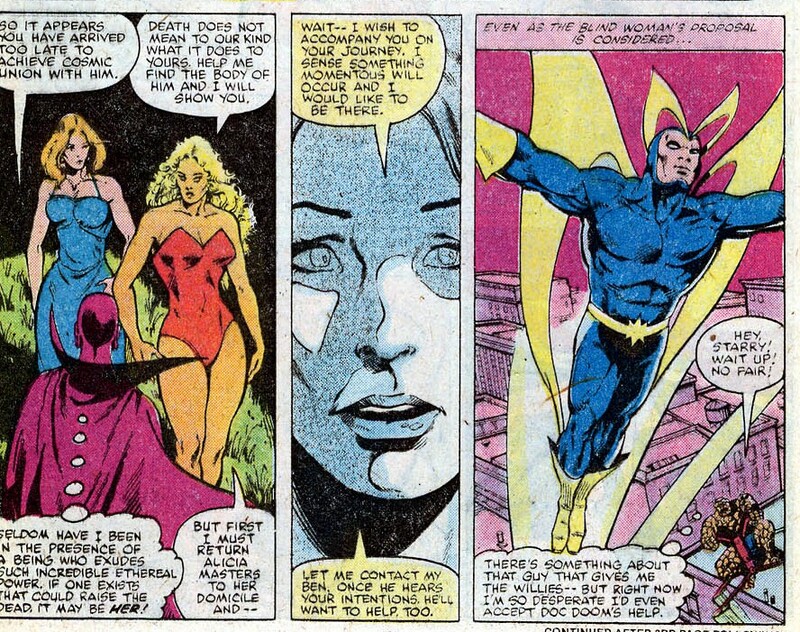 Fearing it to be the return of Michael Korvac and asks that Ben cease his attempts to find Alicia, for then Starhawk can find her instead. Ben listens and agrees as long as he is taken along. 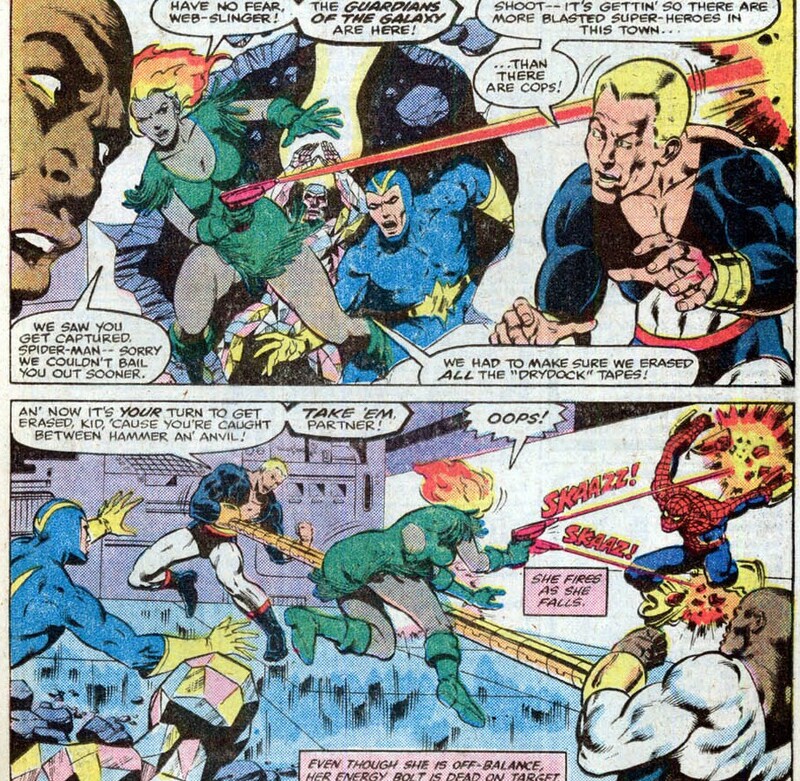 In the park, the golden woman and Alicia are joined by the former Avenger, Moondragon. 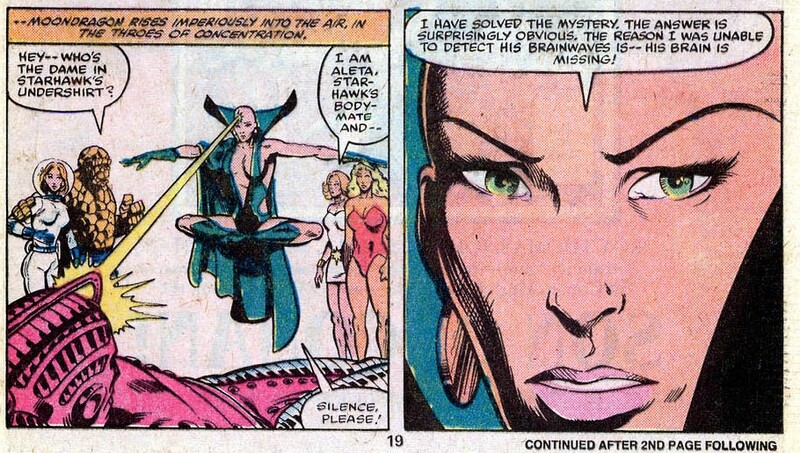 Moondragon points out that she has information that the golden woman needs. 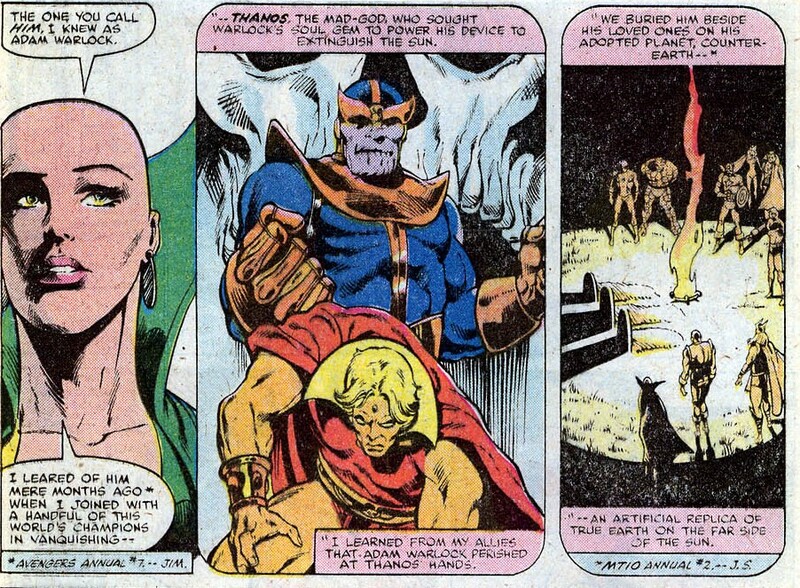 She points out that Adam Warlock was killed by the mad titan Thanos and his body is buried on counter earth. 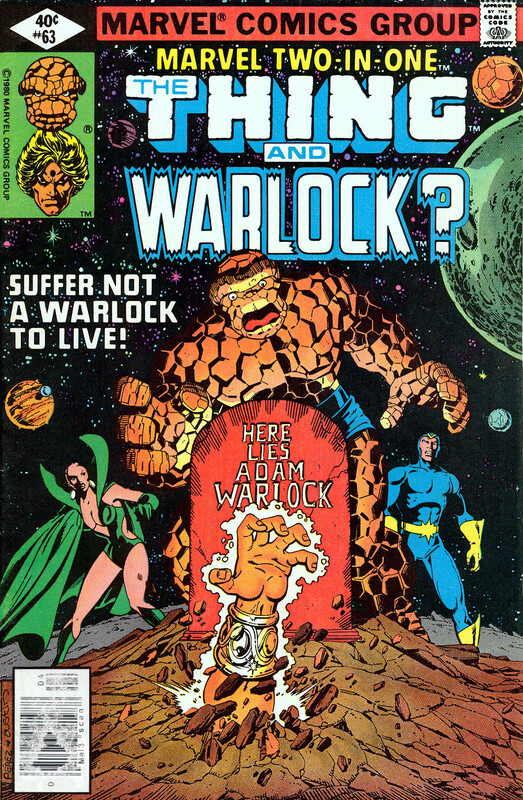 The golden woman, Her, claims that for them, death is not quite the same thing and needs to see Warlock’s body. Her offers to take Alicia home, but Alicia feels this is important and wants to come along, suggesting that Ben is informed. But by that point, Ben & Starhawk arrive in the sky above the partk. 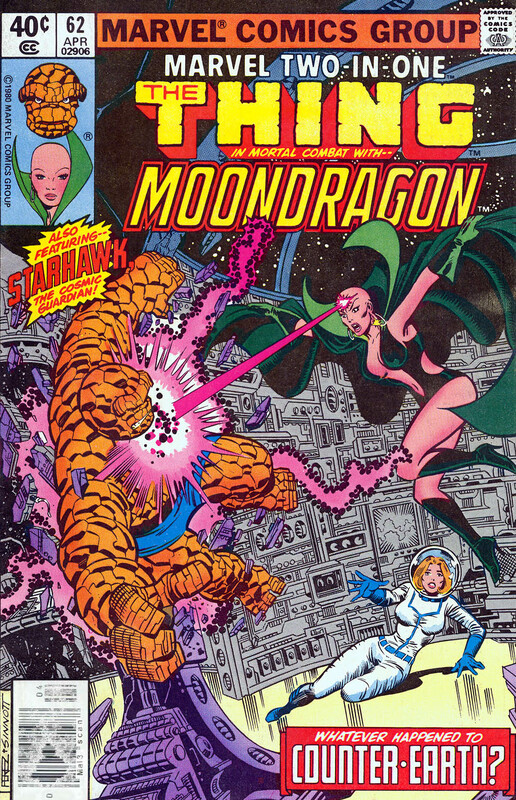 Her requests that Moondragon get her ship, while she attacks Starhawk & Ben. Ben is quickly dispatched, Starhawk gets close to Her and for Ben’s sake asks Her to release Alicia. She does this, long enough to blast Starhawk at close range and send him into the nearby river. Ben is about to throw a concrete post at the ship, but realises that Alicia could be hurt and before he can come up with a plan B, he realises that Starhawk hasn’t surfaced from the water. He dives in and brings the unconscious Starhawk up onto dry land. Starhawk awakens and the two heroes vow to follow Her and get Alicia back. Notes: I’ve always had a soft spot for Marvel Two in One and this is one of the better issues, the connection to Adam Warlock is a pleasant one and leads into the next two issues which are a fun read. 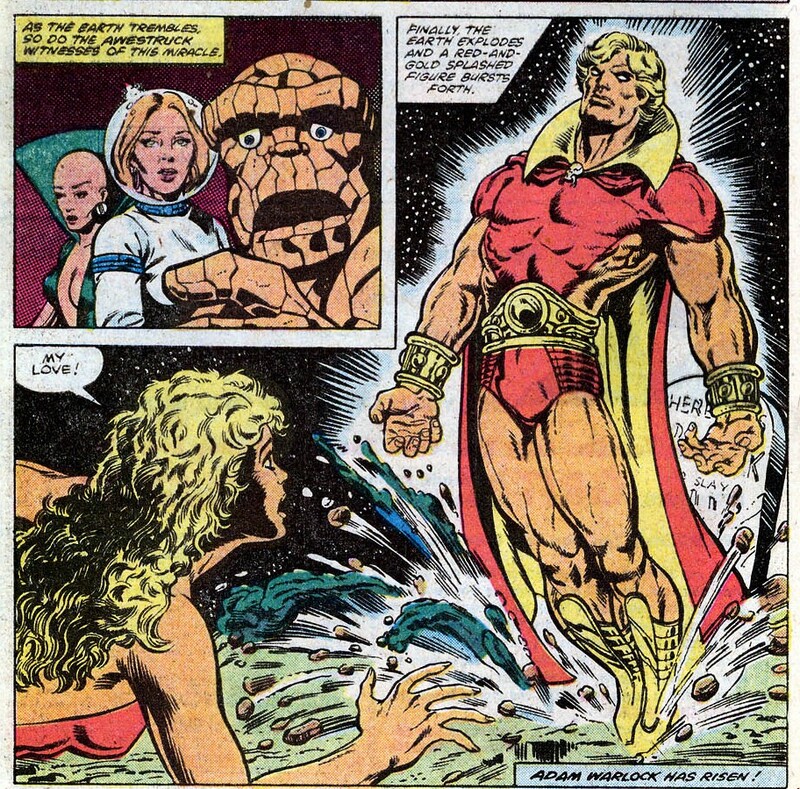 The only other thing to note is that if you want to know more about Him/Adam Warlock and the trio of scientists, check out http://resurrectionsadamwarlock.tumblr.com/ It’s a podcast by a guy called Al Sedano and is a look back at the history of Him and is very entertaining. Marvel Team-Up 86 was cover dated October 1979 and was on sale July 1979, sharing the spinner racks with Action Comics #500, Avengers Annual #9, Justice League of America #171, Machine Man #11, Time Warp #1 and What If? #17. 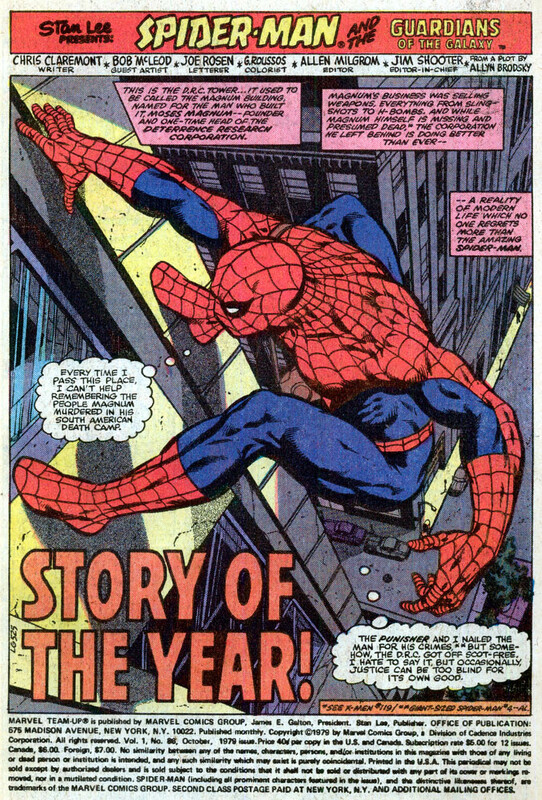 Story of the Year was written by Chris Claremont and pencilled by Bob McLeod and opened with the books lead character Spider-Man climbing the DRC building, the DRC once being run by the supervillain Moses Magnum and is now still quite a shady operation. The DRC are planning something and that rumour has reached the street so Spider-Man is checking it out. Inside, also checking that rumour out is Lawrence Whittier Reynolds III or Rap to his few friends. Rap is in mission control for DRC’s space shot to a familiar space station, Drydock. 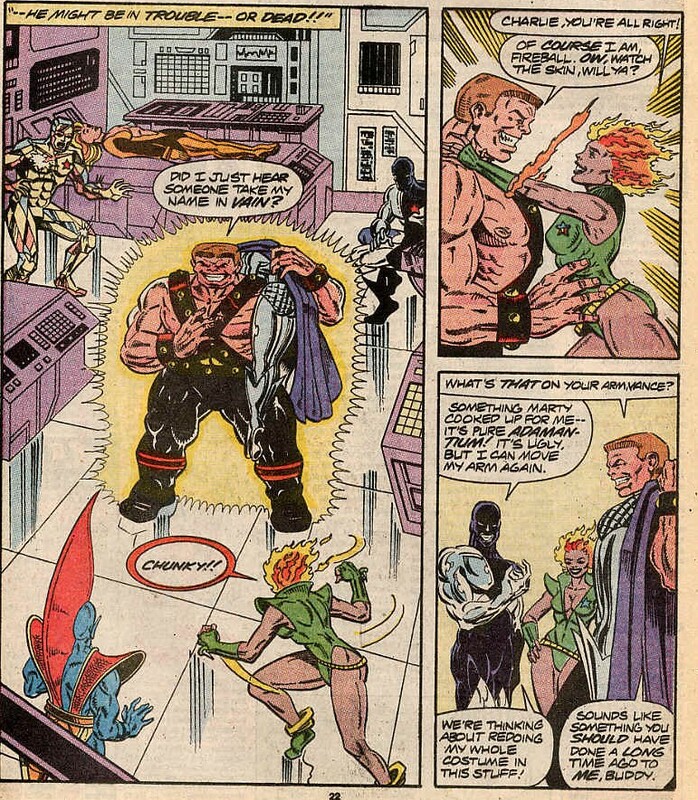 He turns and catches Martinex of the Guardians of the Galaxy hiding in the corner of the room. 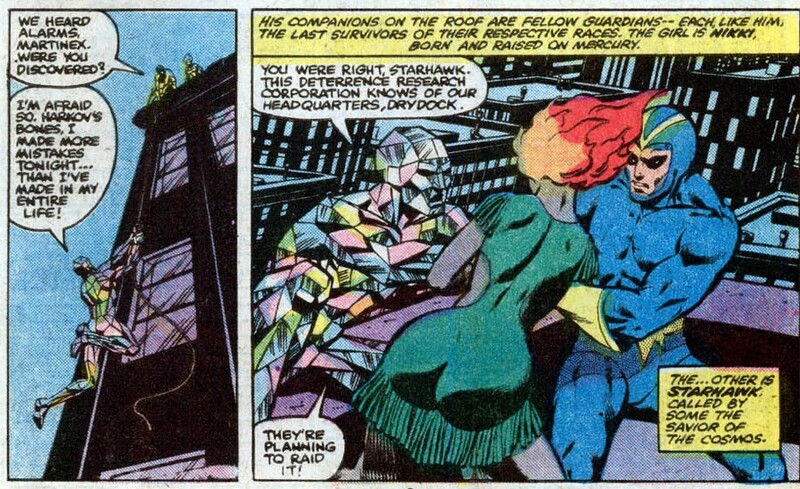 Alarms ring out and Martinex escapes the building and meets up with Nikki and Starhawk who were awaiting him on the roof. 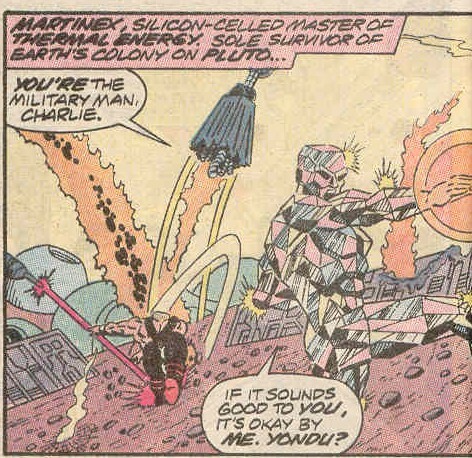 Martinex confirms that the DRC are using stolen S.H.I.E.L.D. files to locate Drydock, but he was seen by another intruder. The other intruder, Rap, climbs a rope down the DRC building with his film of the DRC’s mission control, footage of Drydock and of Martinex. Nikki chases after Rap, but Rap is caught by a DRC security guard Johnny Anvil. Anvil is about to do Rap some harm when Spider-Man arrives and webs Anvil to the wall. 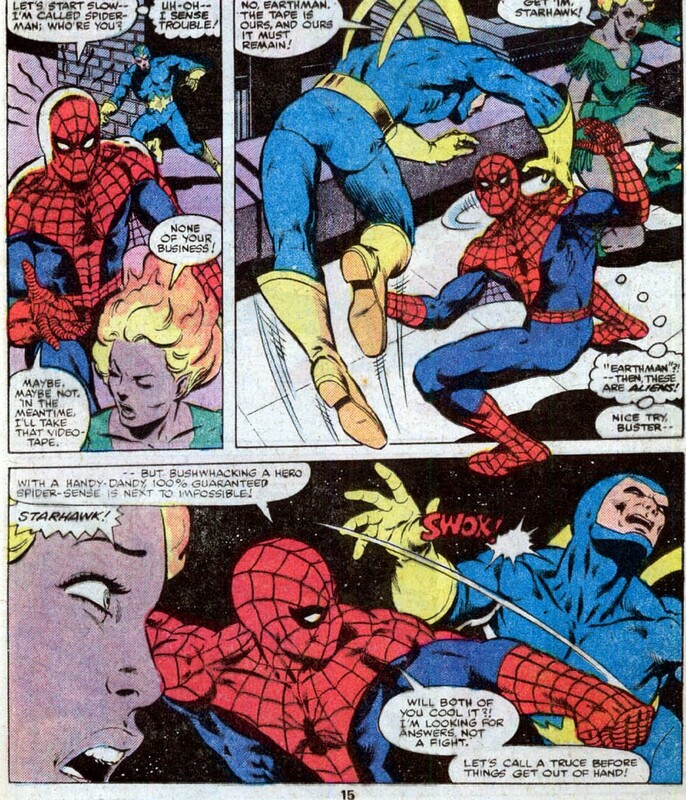 While Spider-Man checks Rap is unhurt, Nikki takes the footage and makes her escape in a taxi. 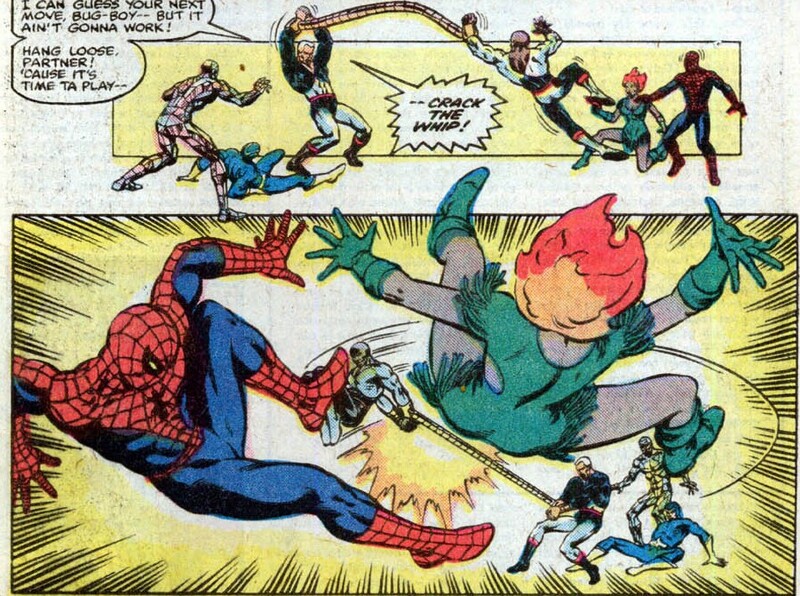 Spider-Man captures Nikki and brings her back to the rooftop, amazed at her fiery appearance. 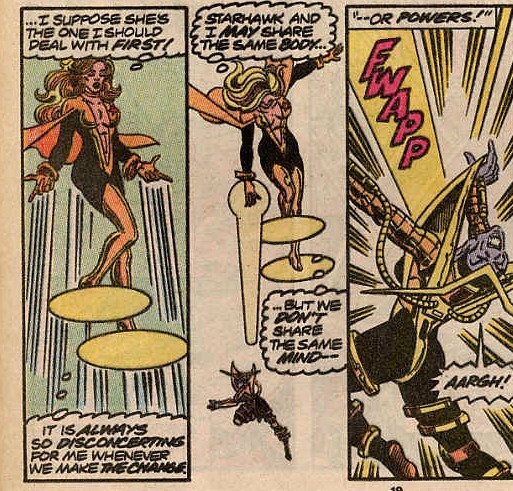 Before he can get the tape off her, Starhawk arrives and a brief fight ensues, ended by Martinex producing his Avengers ID. 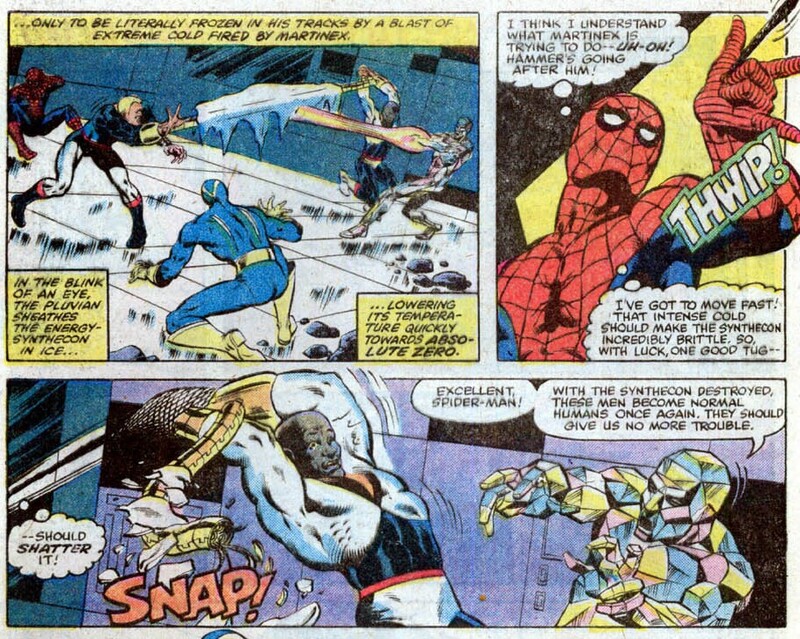 The three Guardians bring Spider-Man up to date Spider-Man decides to back off and let them do what they’re doing. 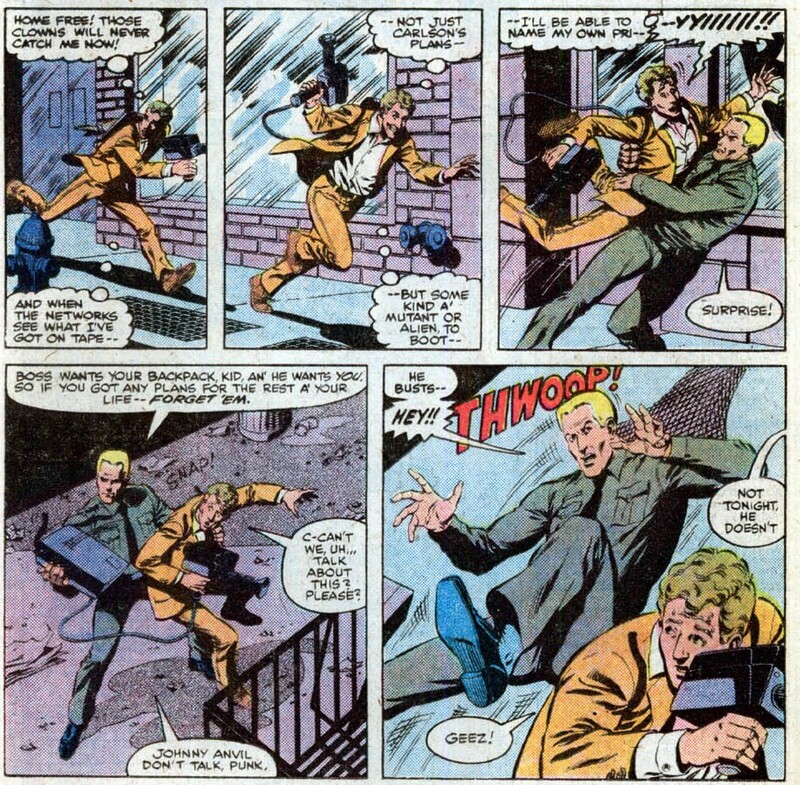 He is swinging towards home when he is attacked by Johnny Anvil and his partner Hammer Jackson, who are using an energy synthecon strapped to their wrists to enhance their strength. Caught by surprise, Spider-Man is overwhelmed and knocked unconscious. 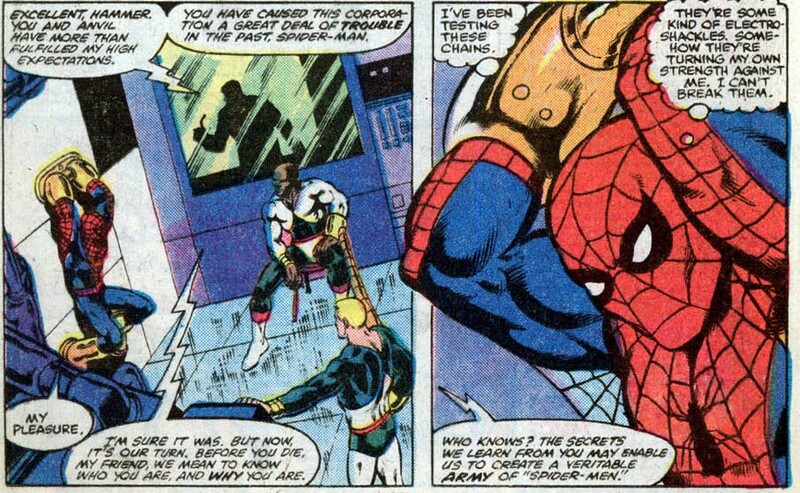 Spider-Man awakes in shackles being questioned by the DRC and Hammer & Anvil. Just before anything happens, the wall is broken through and Martinex, Nikki and Starhawk crash in and start firing. 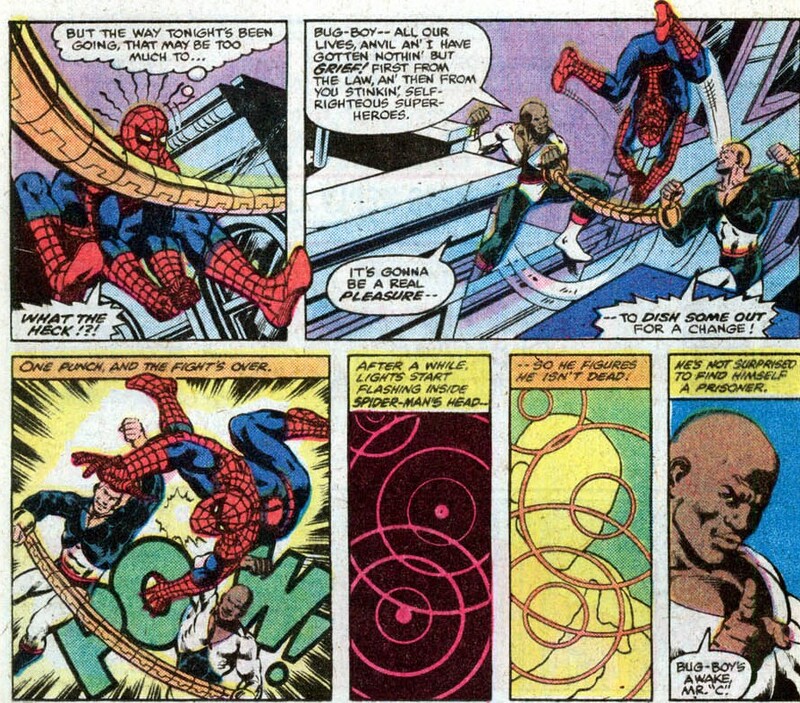 Nikki, while being tripped, still manages to shoot through Spider-Man’s shackles, freeing the webslinger. The four take on Hammer & Anvil and after breaking the energy synthecon beat the pair and the Guardians of the Galaxy erase the stolen files and recent memories from the involved DRC members. The Guardians have destroyed all of the evidence of their presence and plan to move Drydock to another orbit to avoid further detection. The three Guardians get into their shuttle ( WHERE WAS THAT HIDDEN?) and fly off from the roof. Rap the journalist from earlier in the story returns and tries to take pictures and Spider-Man takes his camera and destroys the film. 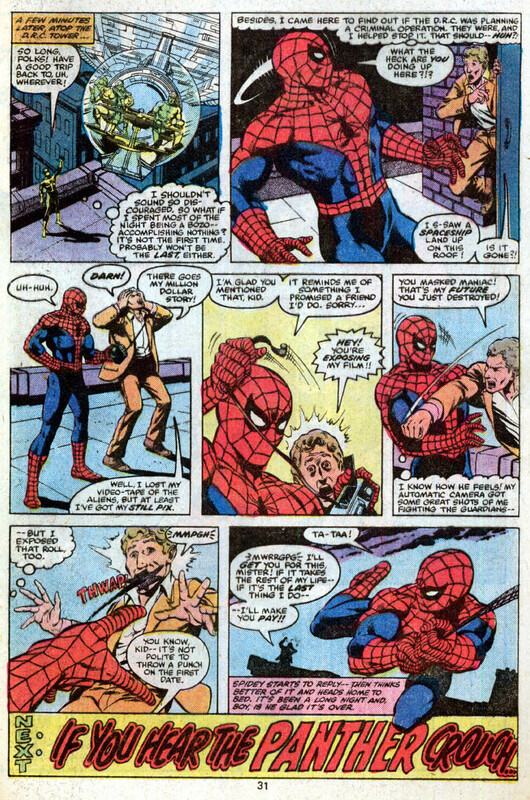 He also destroys his own mini-camera film and then swings off after webbing up Rap’s mouth to end his tirade. Notes: Not a bad issue, Claremont tells a good story based on a plot by Allyn Brodsky and McLeod’s 70’s Marvel house-style is pleasant enough. It’s a bit of a fill in story really could have been the last 20th Century appearance of the Guardians, but there’s still a few more to go. Ms. Marvel 23 was cover dated April 1979 and was on sale on January 1979, sharing the spinner racks with Brave & the Bold #149, Daredevil #158, Justice League of America #165, Micronauts #4, Sgt Rock #327 and Shogun Warriors #3. 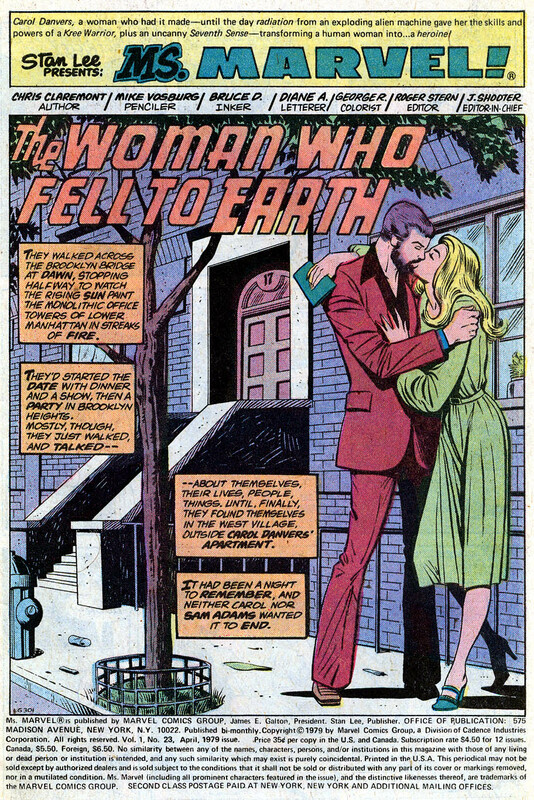 The Woman who fell to Earth was written by Chris Claremont and drawn by Mike Vosburg and opens with Ms. Marvel (in her civilian guise of Carol Danvers) coming home from a date with Sam Adams. 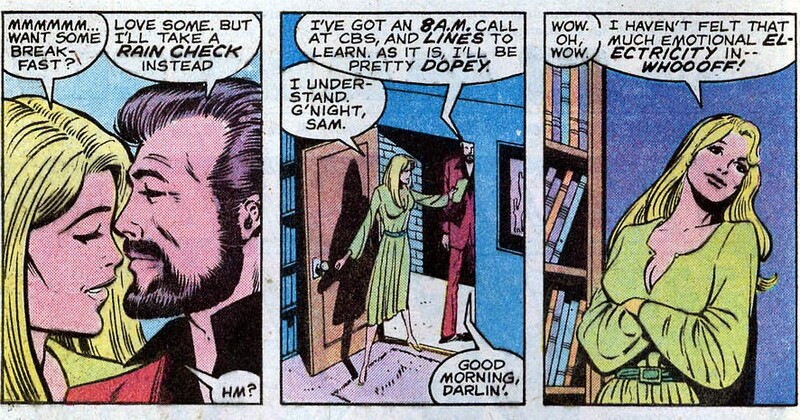 She invites him for ‘breakfast’, but he declines as he’s up early the next morning. As Carol tries to relax after her date, her door is buzzed, she opens the door to find her friend Salia Petrie. Salia is an astronaut friend of Carol’s from her time running security at the Cape. 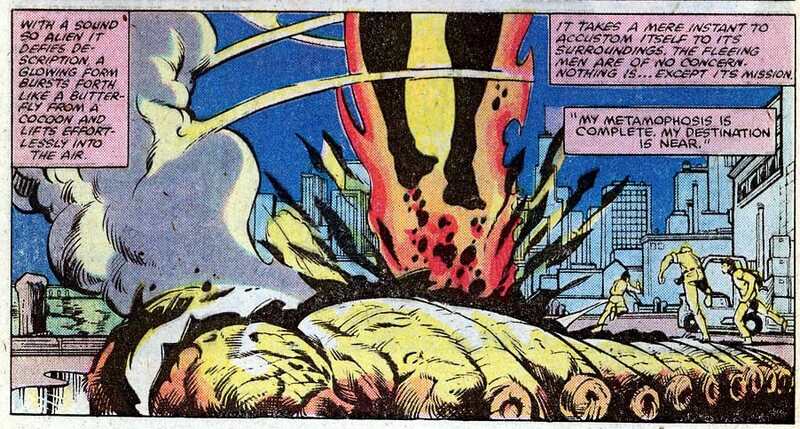 But Salia was declared dead after her rocket was destroyed in Earth orbit. Knowing Salia should be bed, Carol checks with an old NASA contact and Salia is still considered lost. Just then Salia awakes and tells Carol that she didn’t die, but did go to hell and she’s come back for bring Carol there. 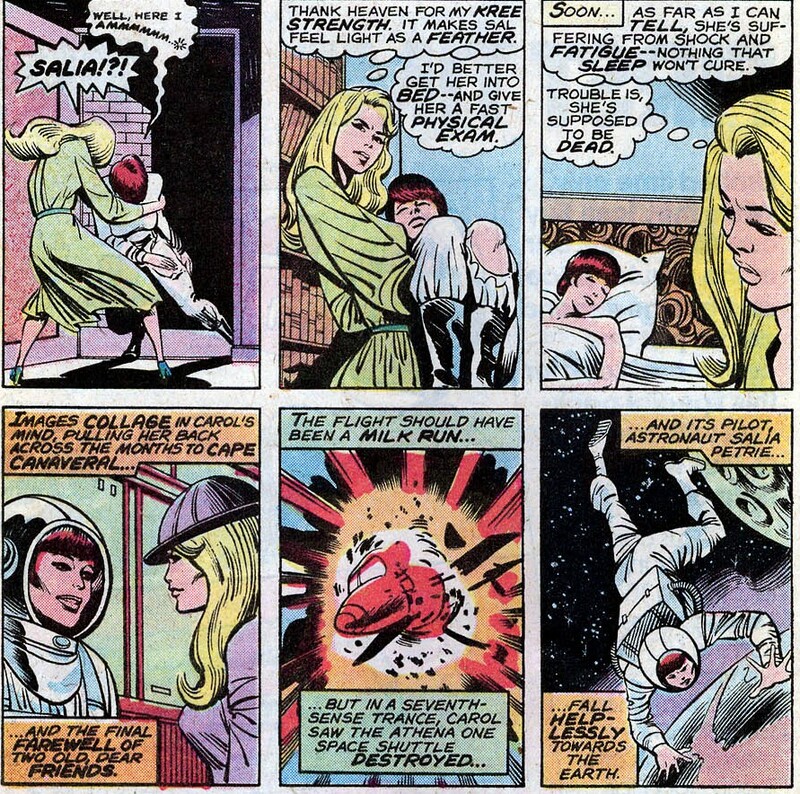 She awakes in front of a costumed man with a yellow orb-like helmet who calls himself the Faceless One. He declares that they are on Drydock and the only way in or out is the teleport chamber that he controls and she should get used to her new home. He attacks her with Drydock’s environmental systems declaring he is going to use his psycho-surgical skills to remake her in his own image. 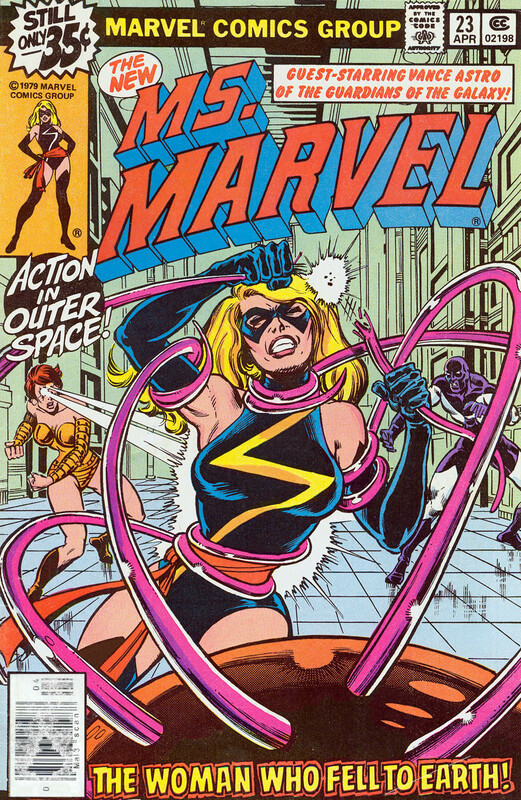 Carol makes a run for it and transforms in Ms. Marvel, she decides to try to find the Guardians of the Galaxy, who she’s aware of through the Avengers. She’s then struck from behind by a psychokinetic bolt. 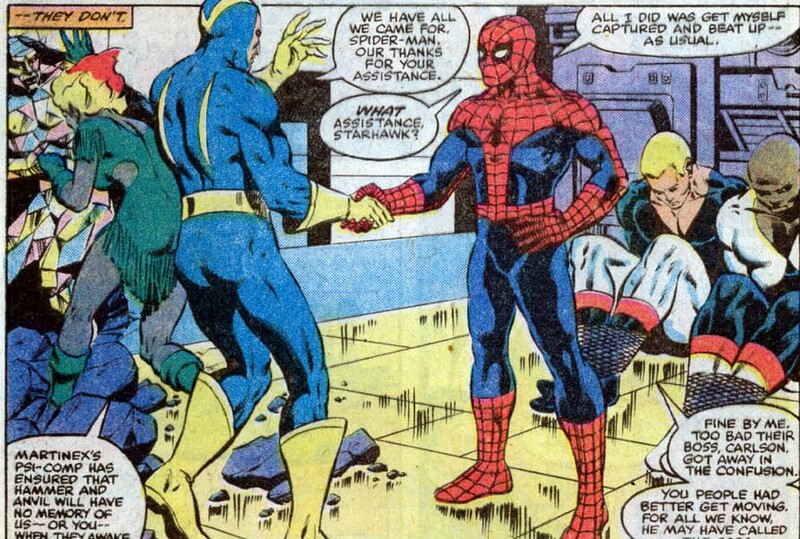 It’s Vance Astro, who unaware of her recent costume updating, has no idea who she is and sees her as the intruder. She dodges his next blast and then knocks him to the floor. She then offers to make peace just as Salia attacks them both. 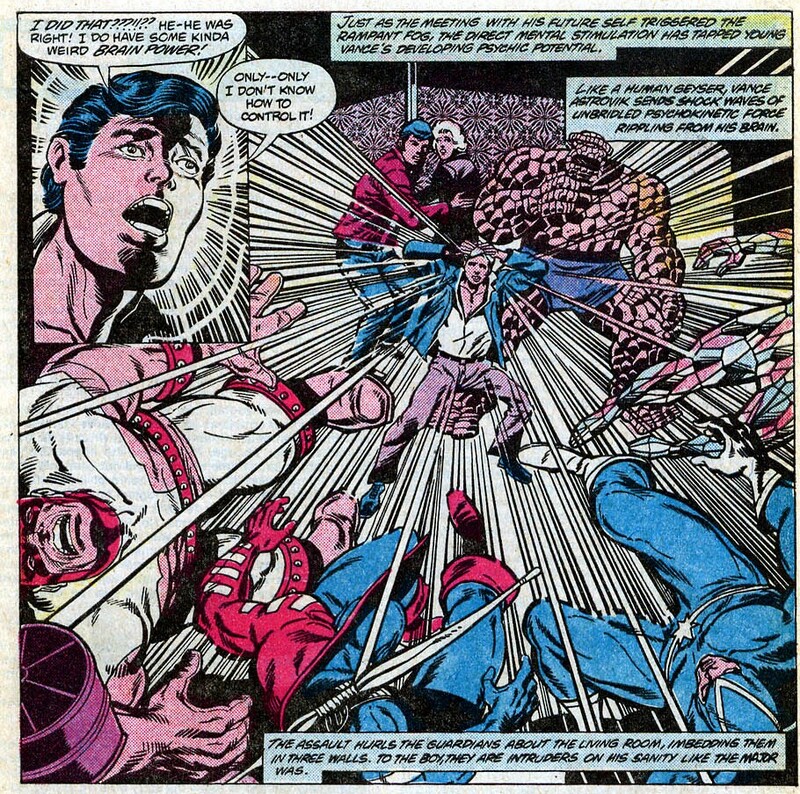 The two are attacked by Salia and the Faceless One, who it is discovered is merely a head with spider-legs on top of a robot body. The pair work together well and turn the tide against the two of them and the Faceless one is defeated. The Faceless One decides on the better part of Valour and is trying to teleport away, when Vance hits him with his psychokinetic blasts, causing the teleport to fail and killing the Faceless One. 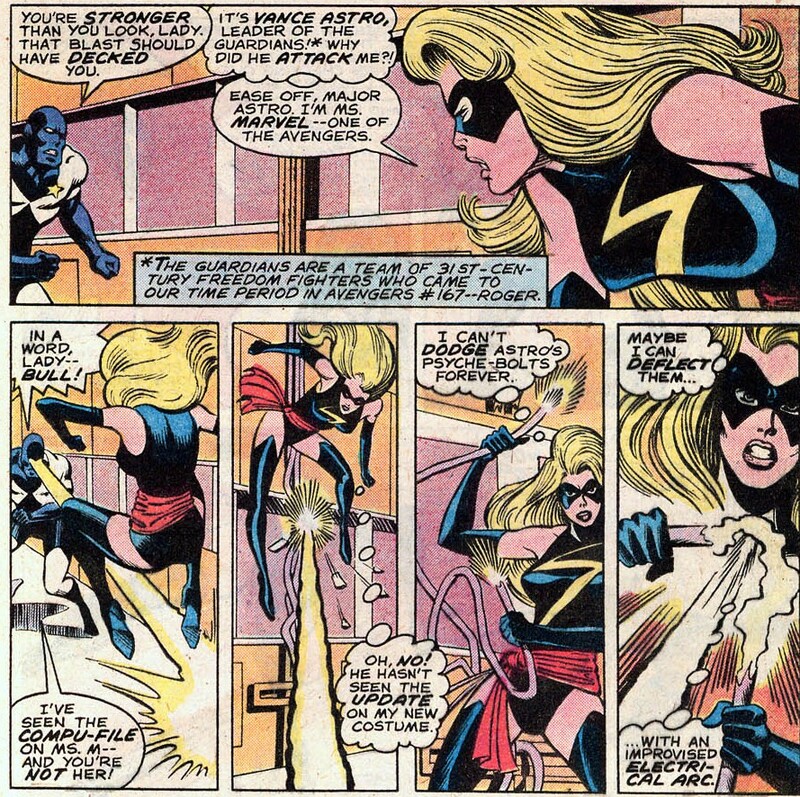 Vance then at Ms. Marvel’s request, Vance destroys a control element Ms. Marvel finds on Salia and then she removes her mask and welcomes her recovering friend back to the world. Notes: A solid issue. Chris Claremont works character into the story well, if only the female characters, Vance could be replaced with anyone and it probably wouldn’t really matter. But with Vance having little to do during the Korvac saga, it’s nice to see him doing something. 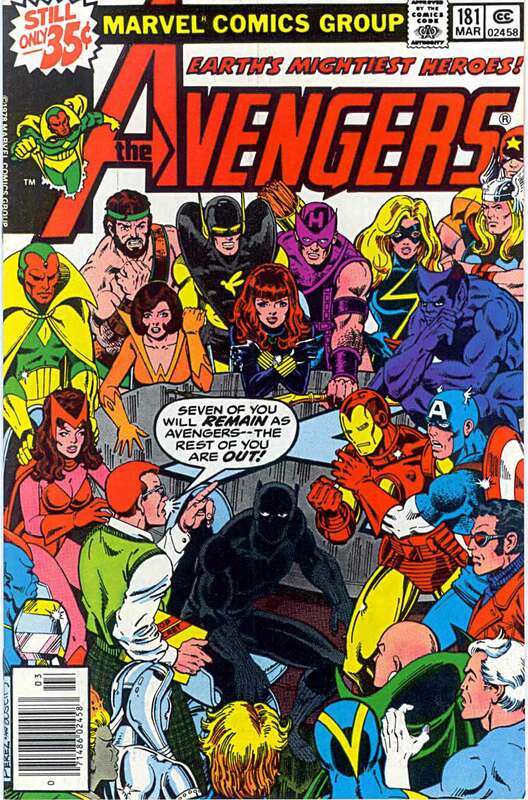 Avengers 181 was cover dated March 1979 and was on sale in December 1978, sharing the spinner racks with Action Comics #493, Battlestar Galactica #1, DC Comics Presents #7, The Man called Nova #24, Superman Family #194 and Thor #281. 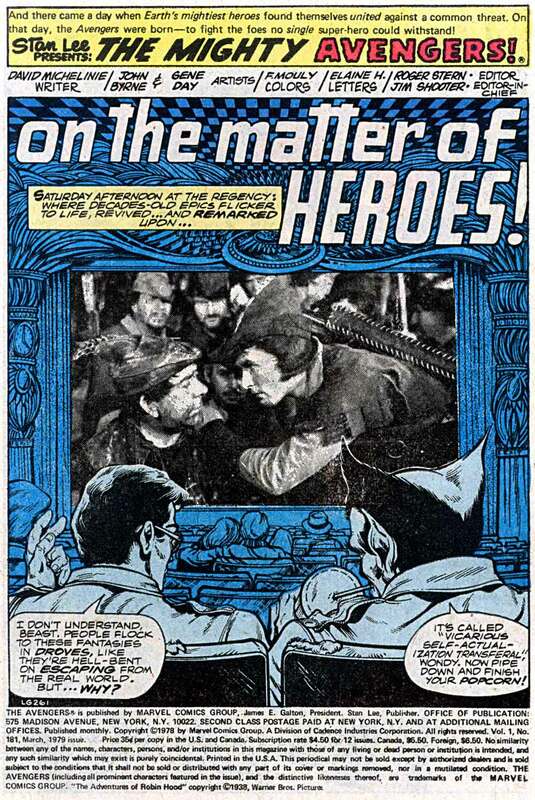 On the matter of heroes was written by David Michelinie and drawn by John Byrne and Gene Day. It opens with Wonderman and Beast at the cinema. Wonderman is still struggling with his role on the team and wonders whether being an Avenger is really what he wants to be doing. 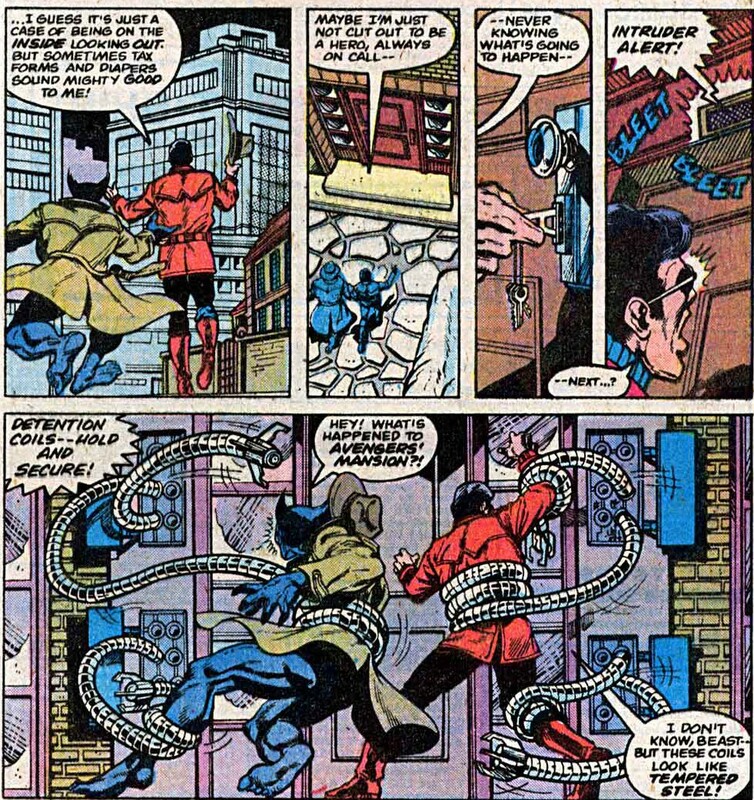 They return to Avenger’s Mansion and are attacked by the mansion’s new security systems. 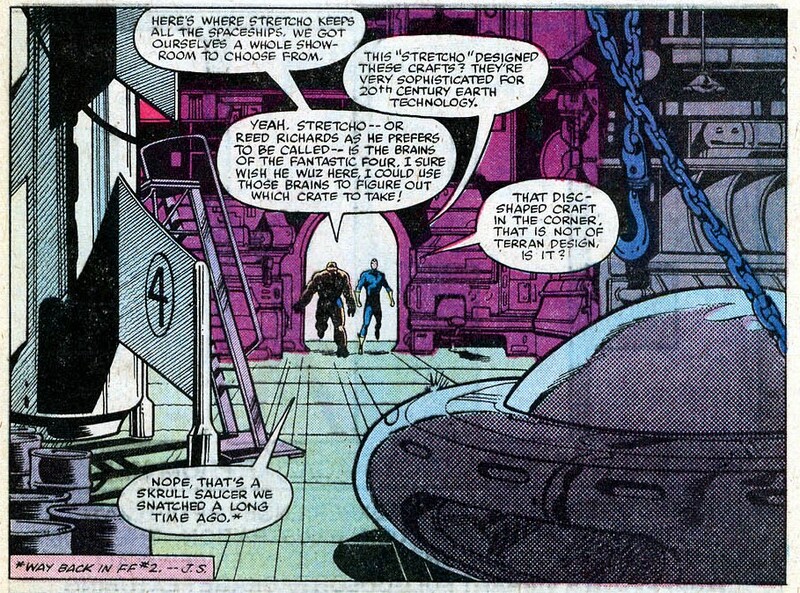 After getting inside by destroying the door, they find Scott Lang and Tony Stark installing these new systems. 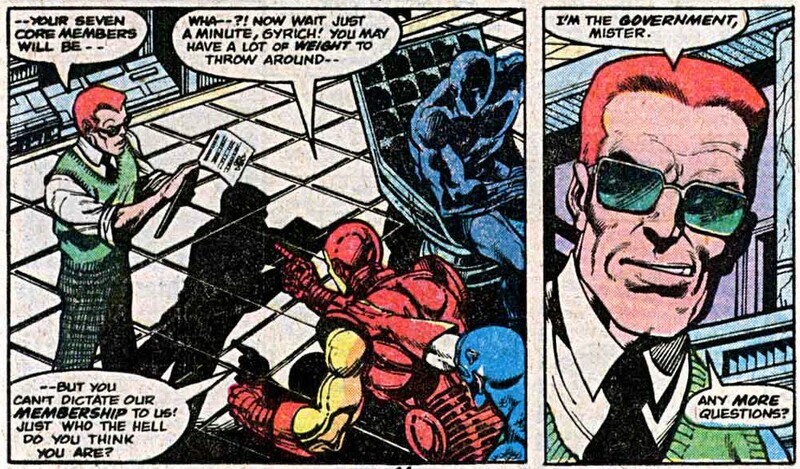 Also present is Henry Peter Gyrich who orders every current Avenger to the conference room. He is going to reinstate the Avengers clearances and priority status, but there will be conditions. 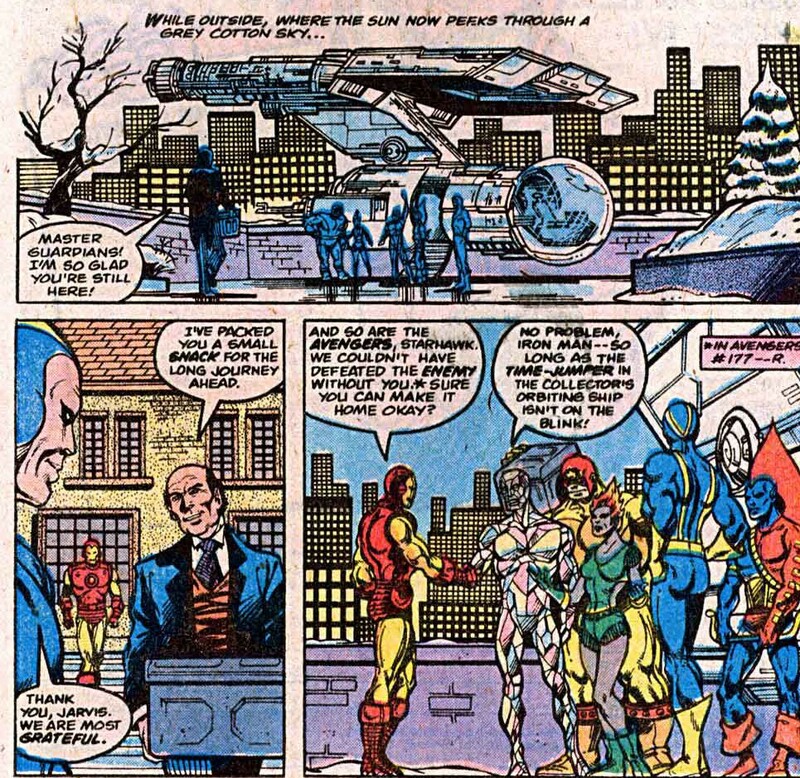 Outside, an old man witha thick eastern european accent gets out of a cab outside Avengers Mansion. The first thing he points out is that there’s too many members. Look at the picture above.. At this point all of them are Avengers, including all but one of the Guardians of the Galaxy. For security reasons, there needs to be a limit of seven, all of which chosen by the US government. Chosing Iron Man, Vision, Cap, Scarlet Witch, Beast and the Wasp from those present and suprising everyone, especially Hawkeye with the addition of the Falcon. 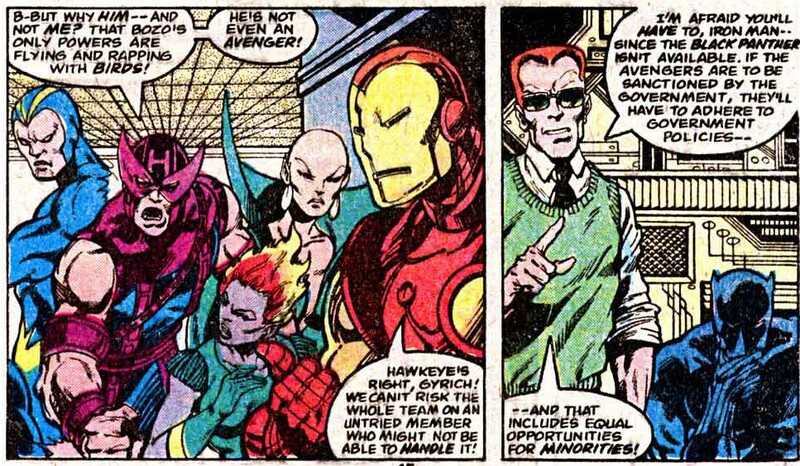 The Falcon is an addition by way of affirmative action, representing minorities in a government affiliated group, it’s not unreasonable, but Falcon has never served as an Avenger, only Cap knows him at all and his inclusion puts Hawkeye off the team, just as he’s come back, which really is only a bad thing to Hawkeye. 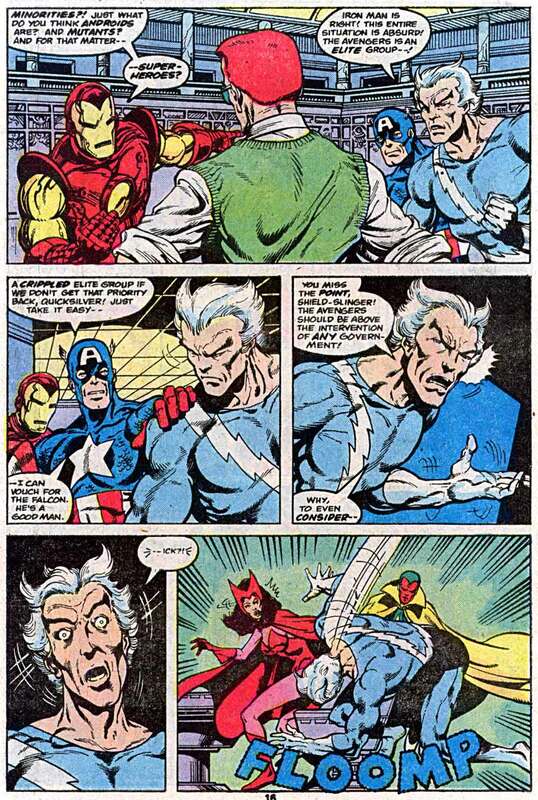 Iron Man and Quicksilver both start arguing with Gyrich, each quoting different reasons until Quicksilver collapses. 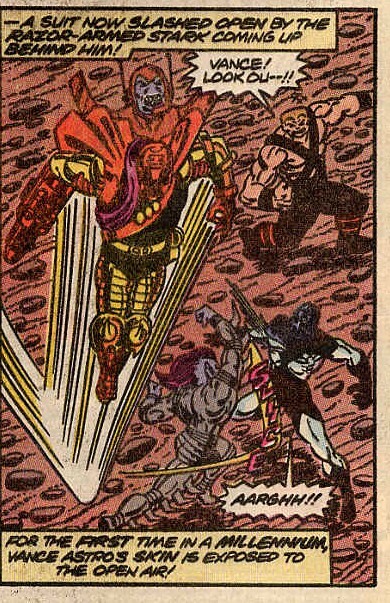 He is taken to the infirmary by Scarlet Witch, Thor and Iron Man. Thor makes excuses and returns in his human guise of Dr Donad Blake. The rest of the team move into different parts of the mansion and wonder about their next moves. 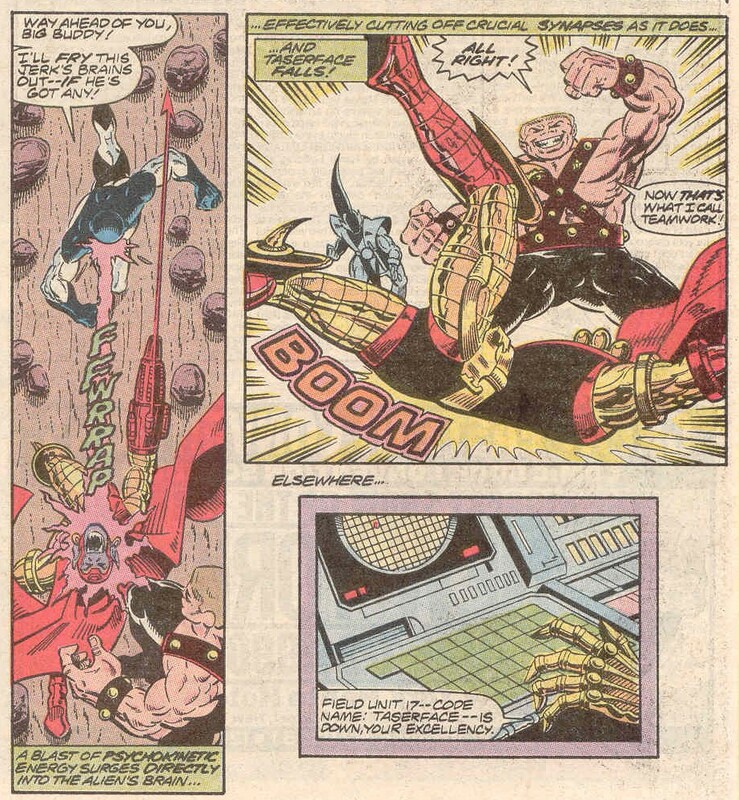 Wonderman decides to try acting as a profession, Hawkeye mopes around and the Guardians of the Galaxy decide to return to space and use the Collector’s ship’s systems to return them to the 30th Century, now that Michael the Enemy/Korvac has been defeated. Hercules and the Black Widow fly off in the Champions’ flying car. 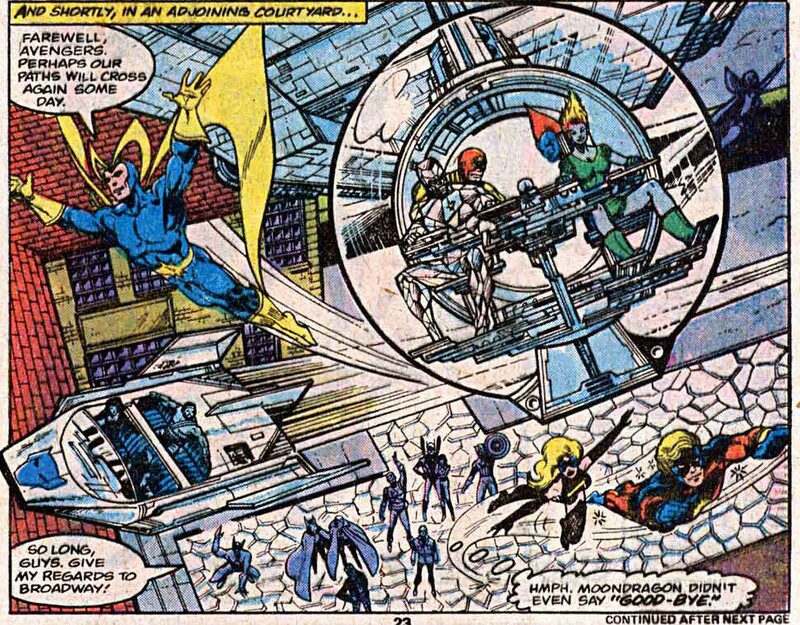 Moondragon, Ms Marvel and Captain Marvel fly off as do the Guardians whilst Yellowjacket points out that it’s a shame that only Wasp is on the Avengers, till she points out that she has him to come home to and get reacquainted with. Gyrich tells the remaining team that inside 24 hours, all non-core team members need to be gone. 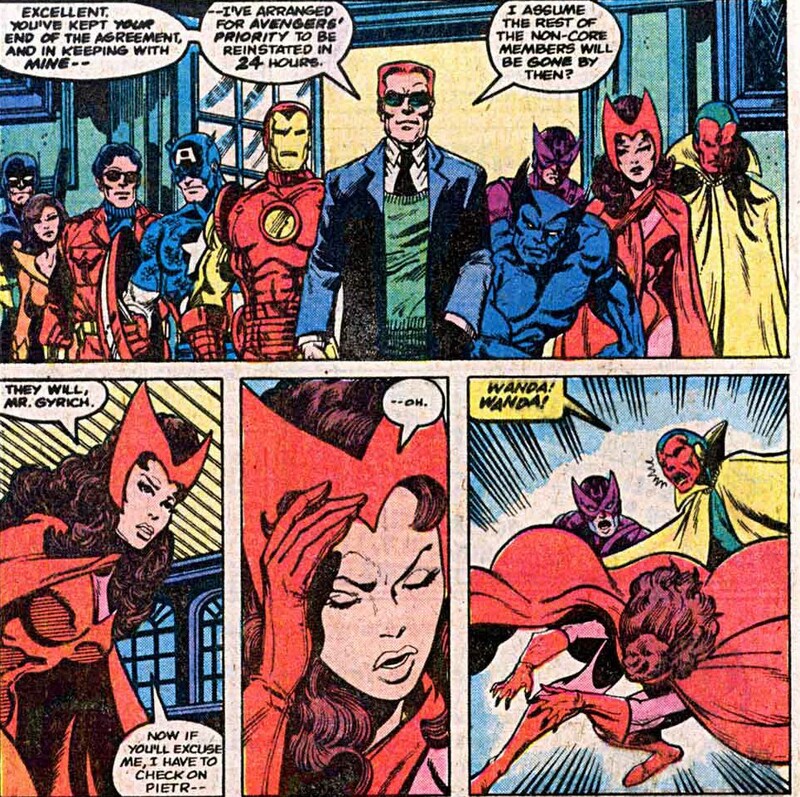 Just then Scarlet Witch collapses just as her brother did. Dr Blake points out that their hearts aren’t beating, but their blood contains the right level of oxygen and their cells are not deteriorating, so whilst they aren’t alive, they aren’t dead either. 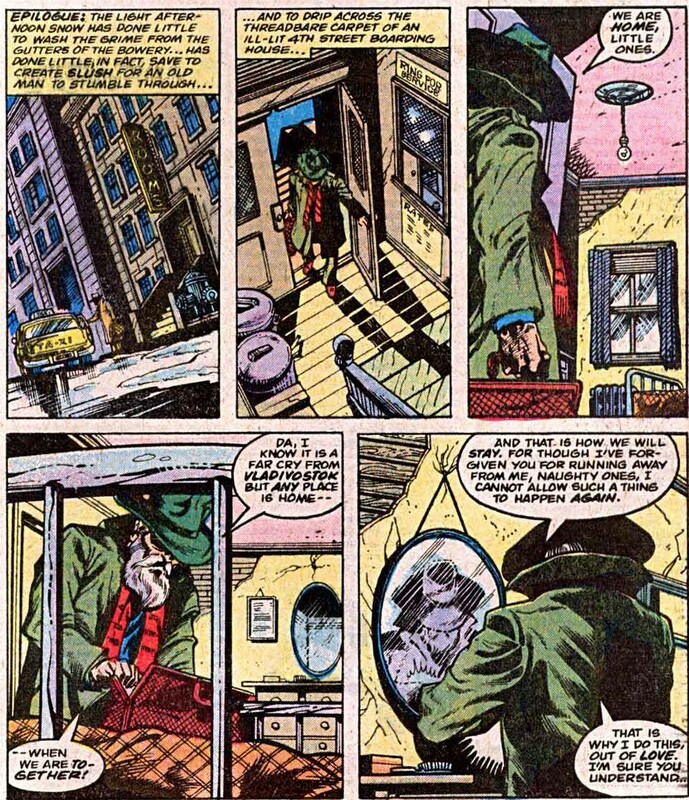 As the issue ends, the old man from earlier is seen going into a cheap motel in the bowery. He seems to be talking to the contents of his bag, calling them his children. 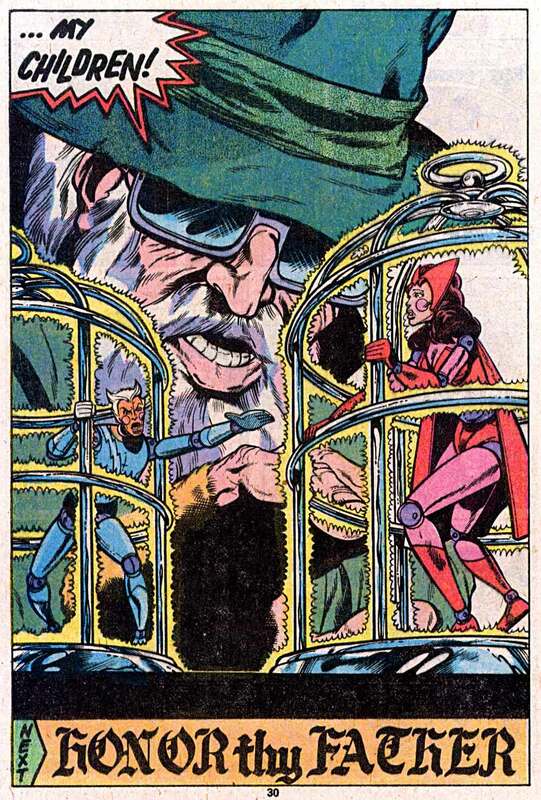 He takes out two cages from the bag and inside are two animated puppets, looking just like Quicksilver and Scarlet Witch, with Quicksilver reaching for his sister. Notes: This story pretty much ends the Guardians of the Galaxy’s association with the Avengers and acts as a sort of epilogue to the Korvac Saga. 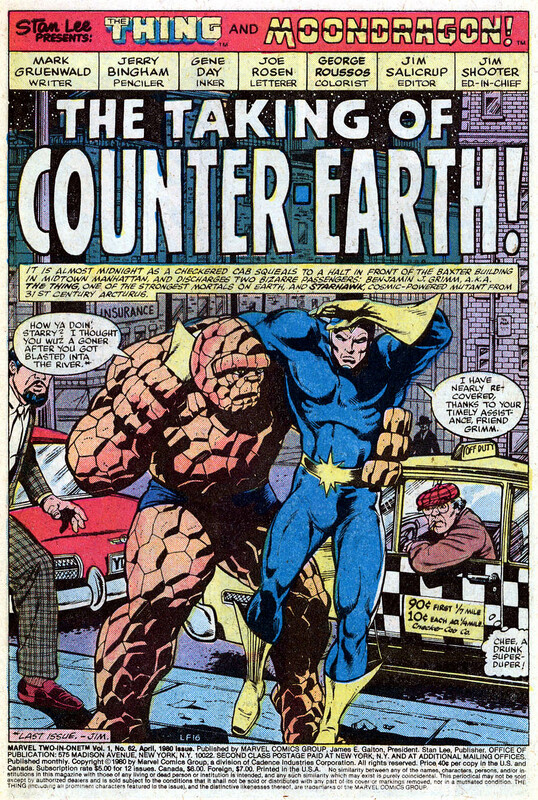 The reason I love this story so much is little to do with the Guardians, it’s the artist, John Byrne. 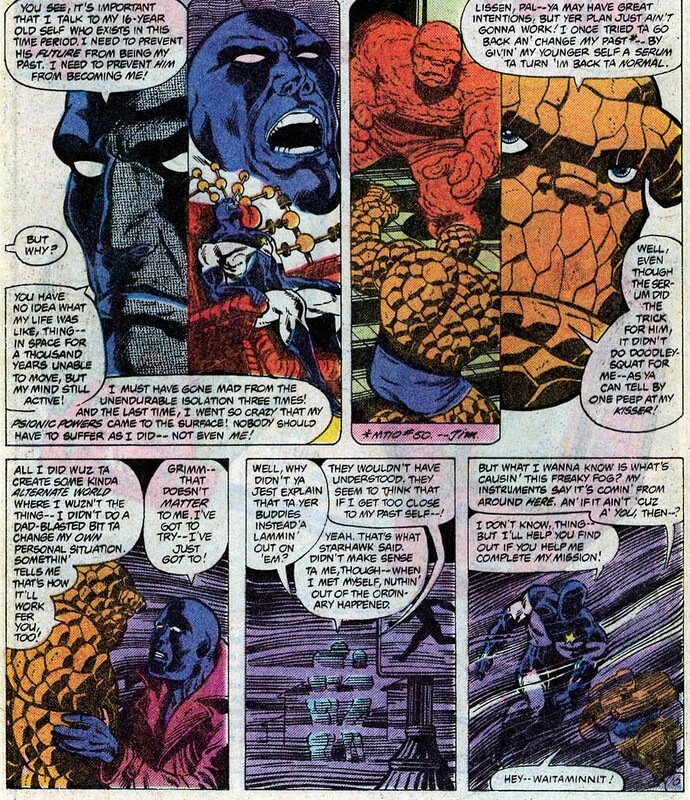 John Byrne is one of the best comics artists of this era and has worked for Marvel and DC both and as a result has written/drawn most of my favourite comic characters. His run on Avengers West coast got me to fall in love with it. His collaboration with Chris Claremont made the X-Men the comics leviathan it has been since the late 70s and much like Views from the Longbox’s Michael Bailey, John Byrne created MY Superman. I could wax lyrical about how many of Byrne’s comics I love, maybe I will at some point, but that’s the reason I enjoyed this story. The Guardians of the Galaxy stick around the 20th Century a bit longer with another 6 appearances before they leave for their own time and place in the universe.